During my recent visit to the Kgalagadi Transfrontier Park I stumbled onto, what turned out to be, an very interesting sighting in the Nossob river bed, close to Rooiputs. 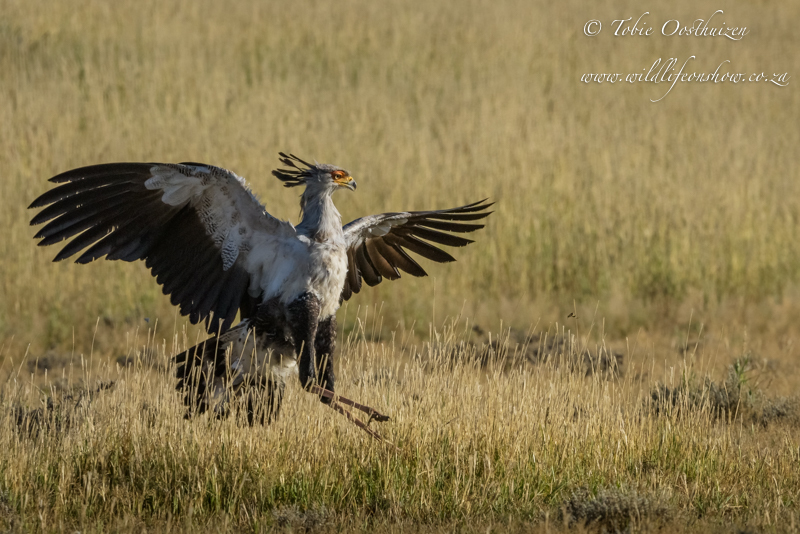 A secretary bird was hunting for insects and other tasty snacks in the area. 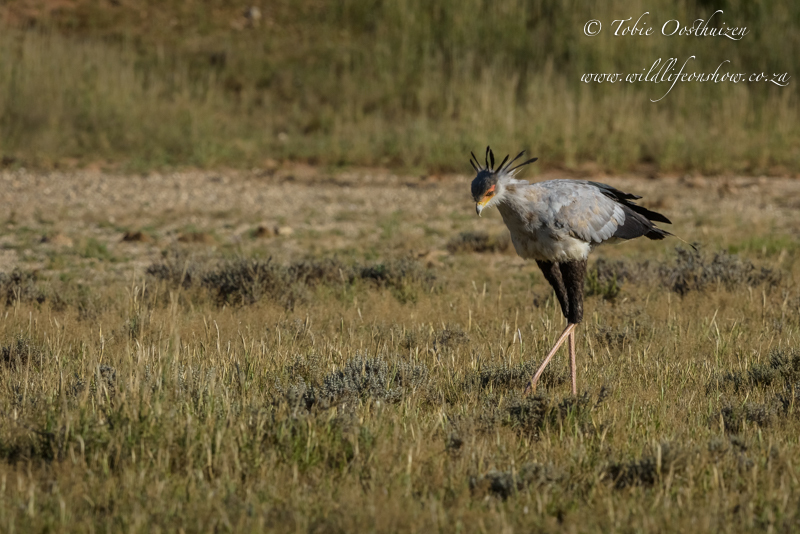 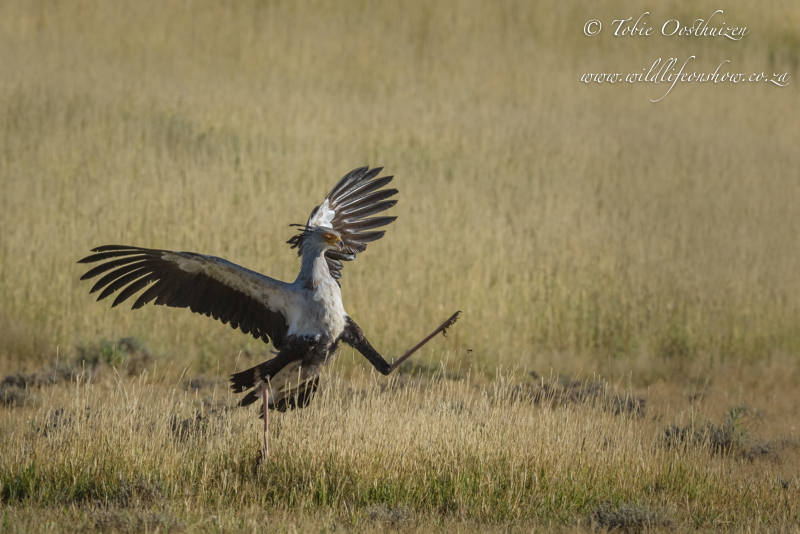 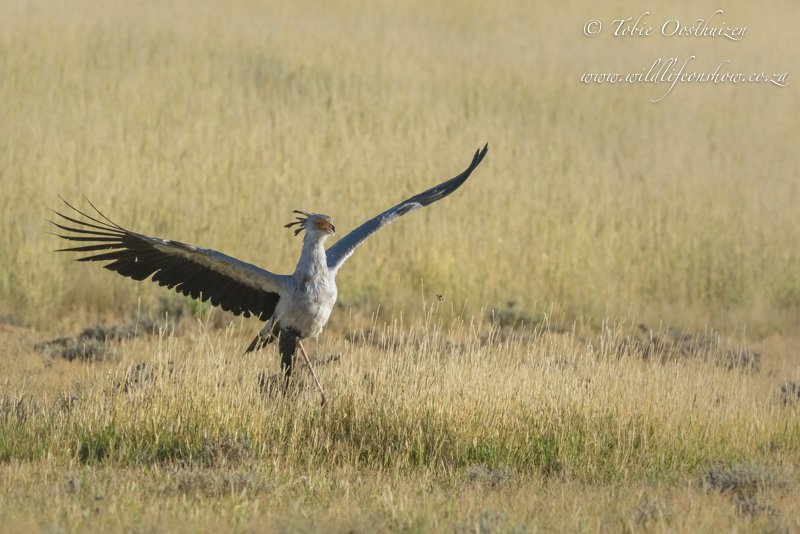 The bird was walking from bush to bush, flapped it’s wings and waited for something to move so that it can very quickly be stomped upon (the secretary bird hits the target very hard and incredibly fast with it’s claw). 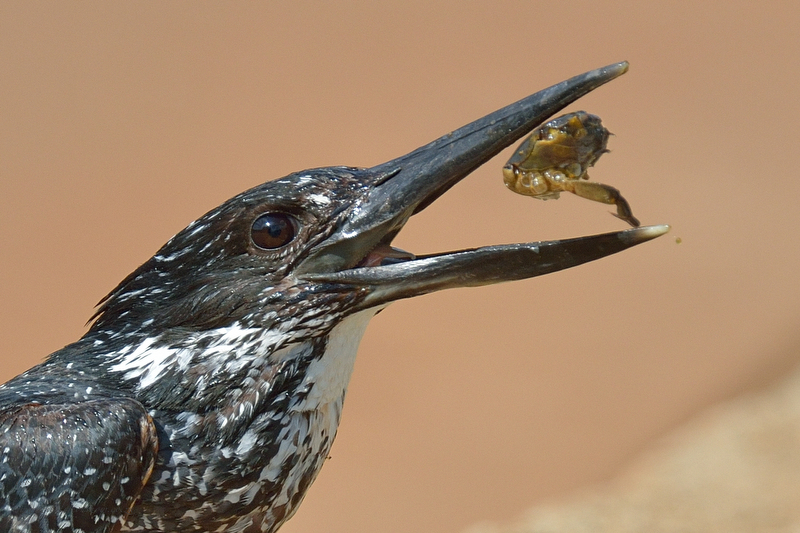 From one of the bushes a tasty grasshopper appeared and tried it’s best to escape the deadly claw. 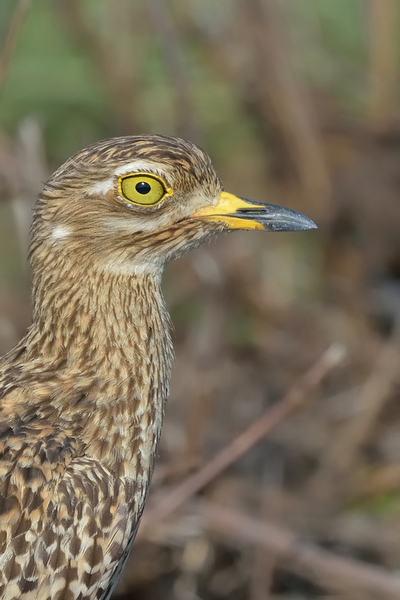 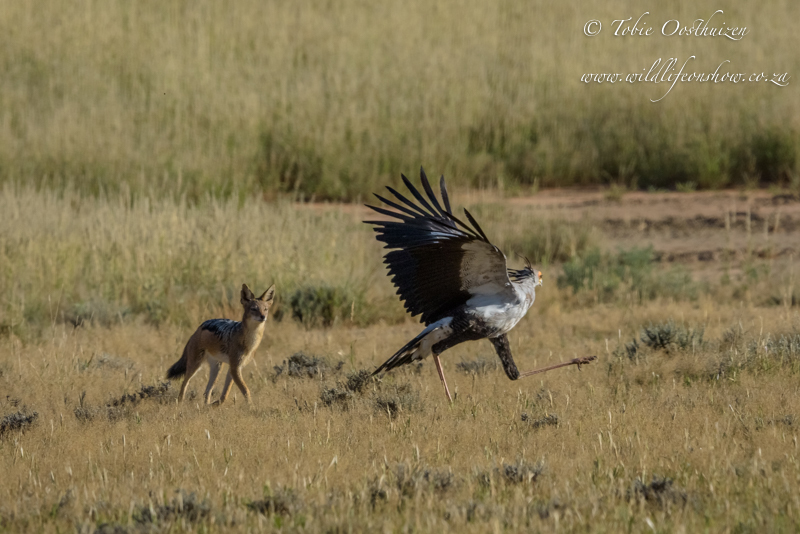 The secretary bird very quickly pursued this tasty morsel and tried it’s best to catch up with it. 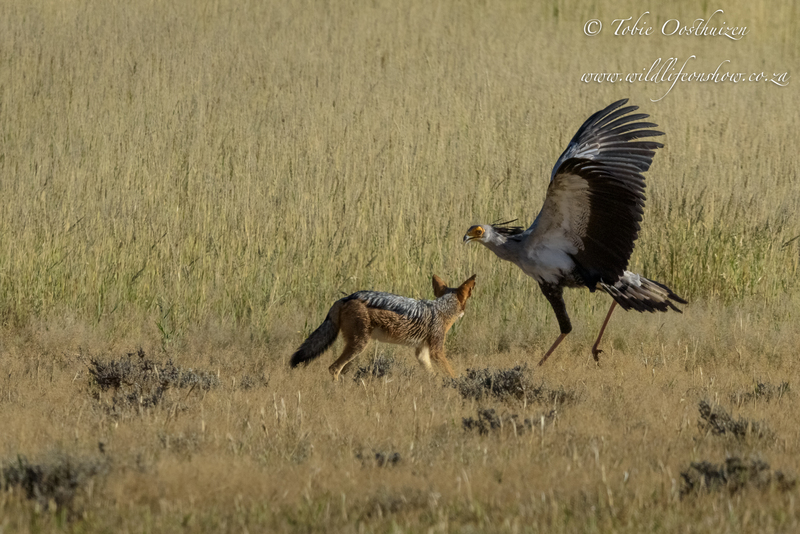 All this excitement very quickly drew the attention of a young Black-backed jackal that was hanging around. 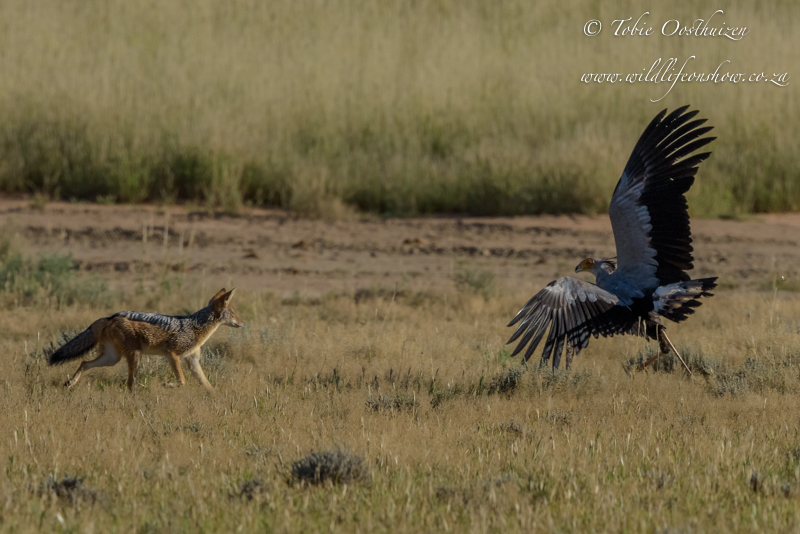 The jackal was under the impression he can quickly sneak in for a quick win. 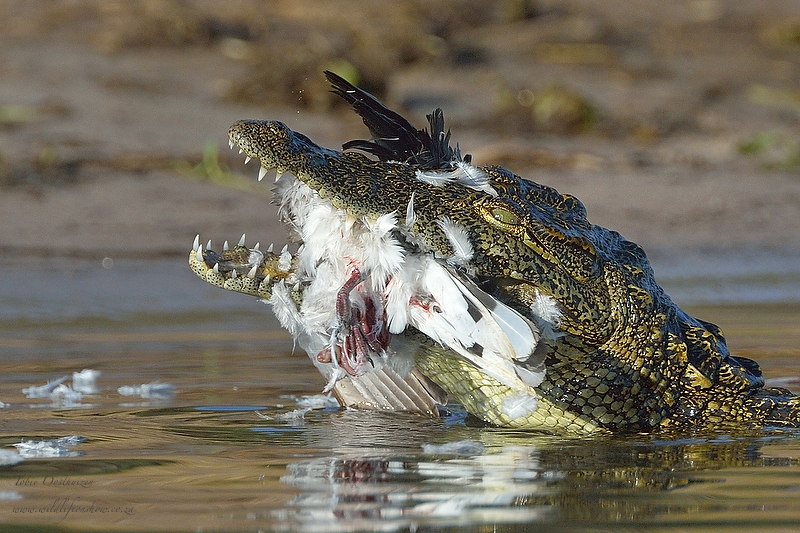 Now the hunter became the hunted. 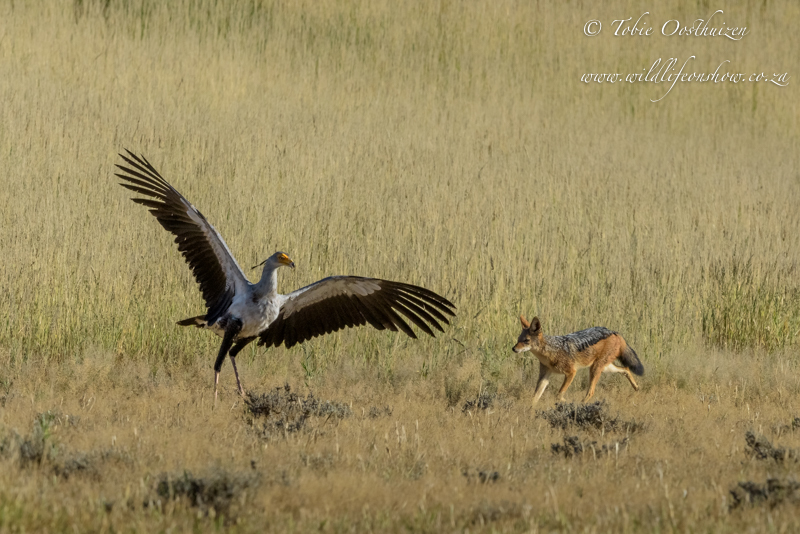 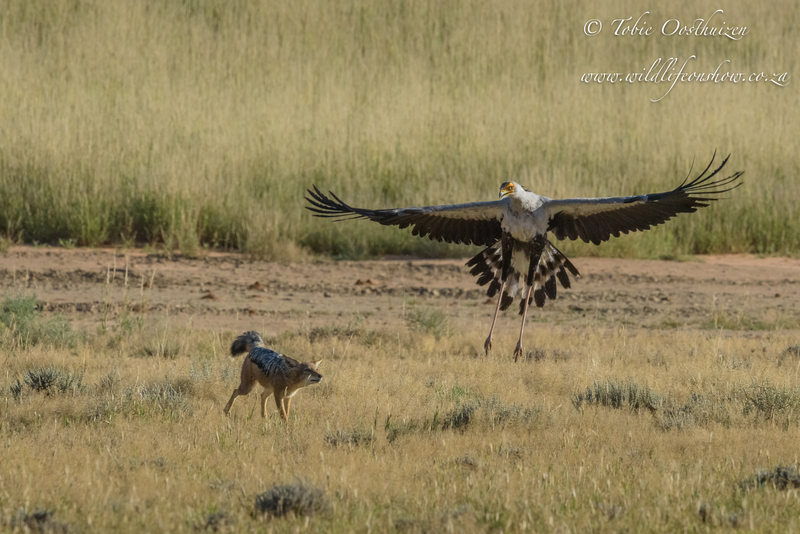 The jackal made a few quick dashes for the secretary bird but was punching above his weight. 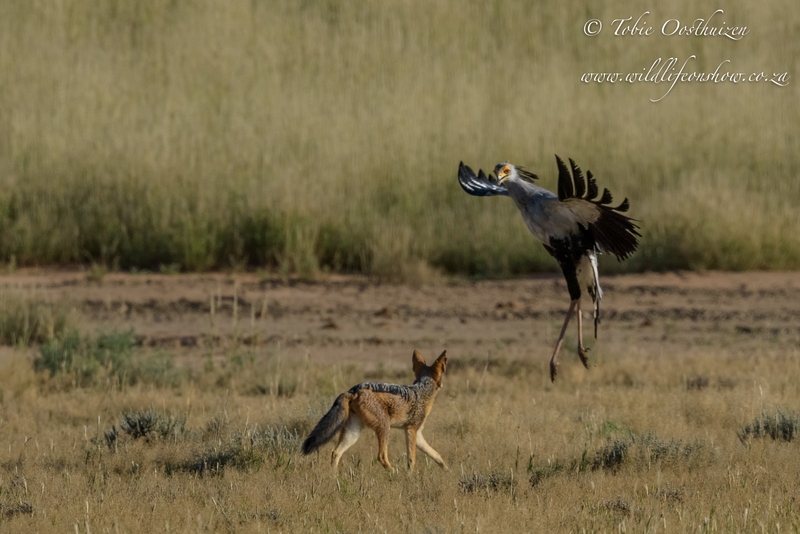 Suddenly the secretary bird decided he had enough and turned to face off the jackal. 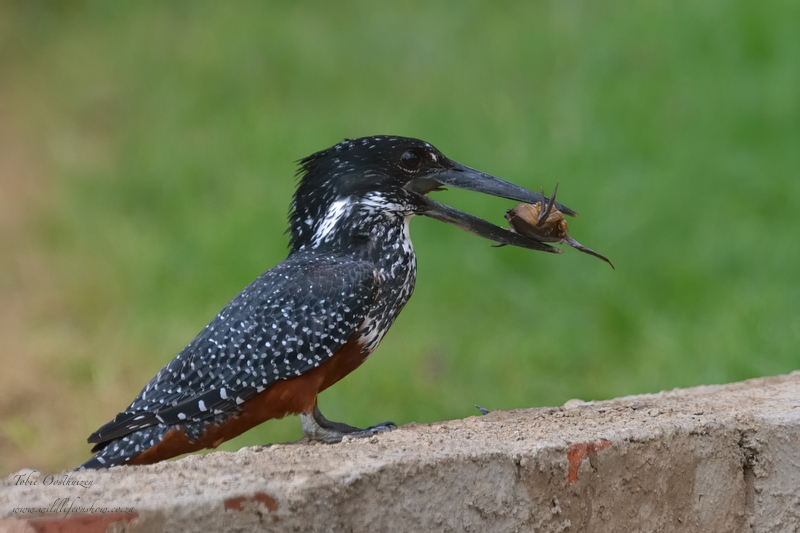 He came in for the strike with those deadly feet. 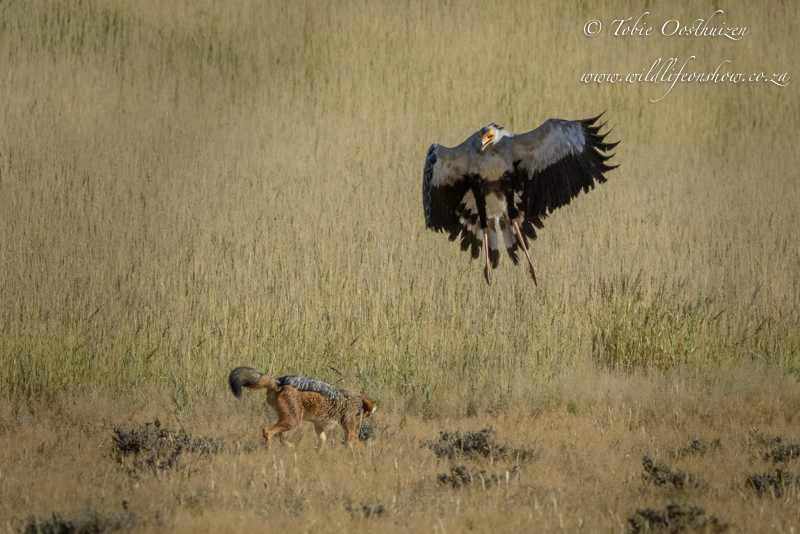 This was just too much for the poor jackal, who trotted off and the secretary bird continued hunting. 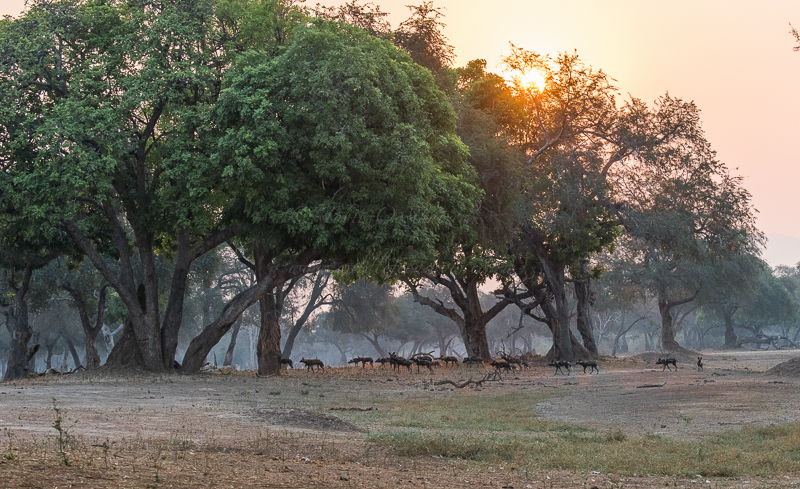 Peace returned to the Nossob valley. 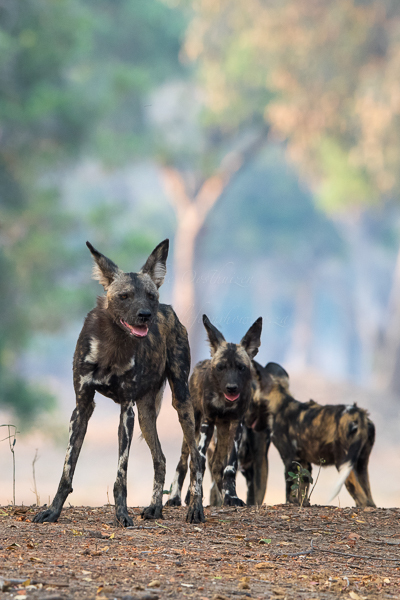 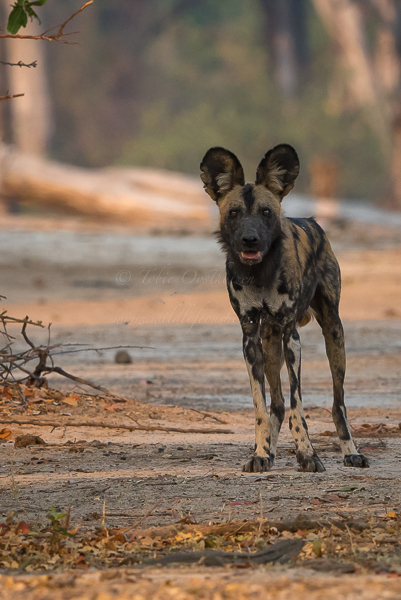 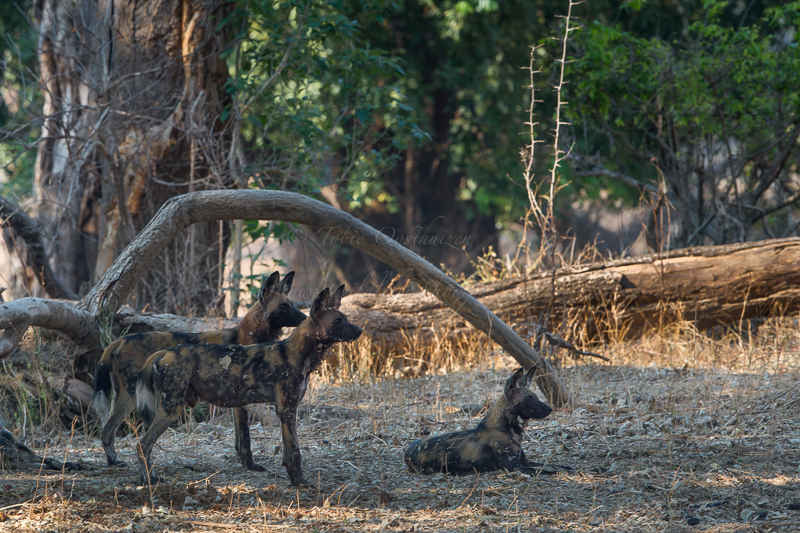 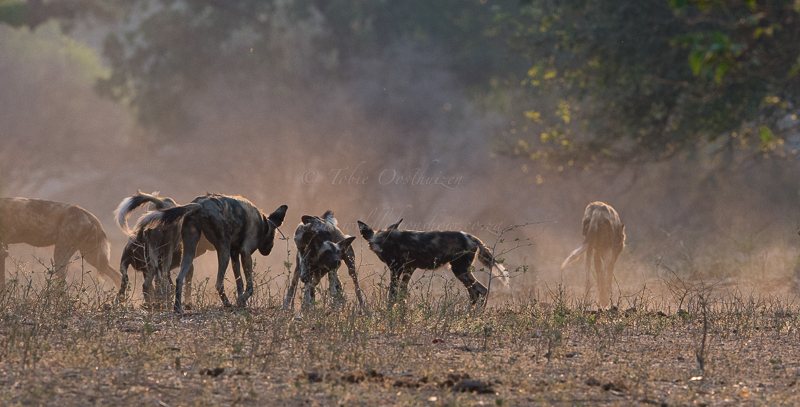 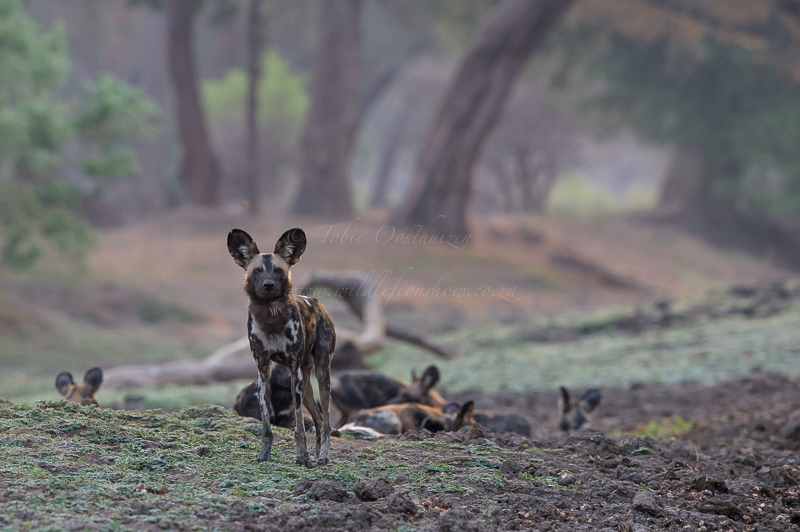 During my recent Mana Pools Photographic Safari with Marlon du Toit of Wild Eye we followed a pack of 29 wild dogs on foot. 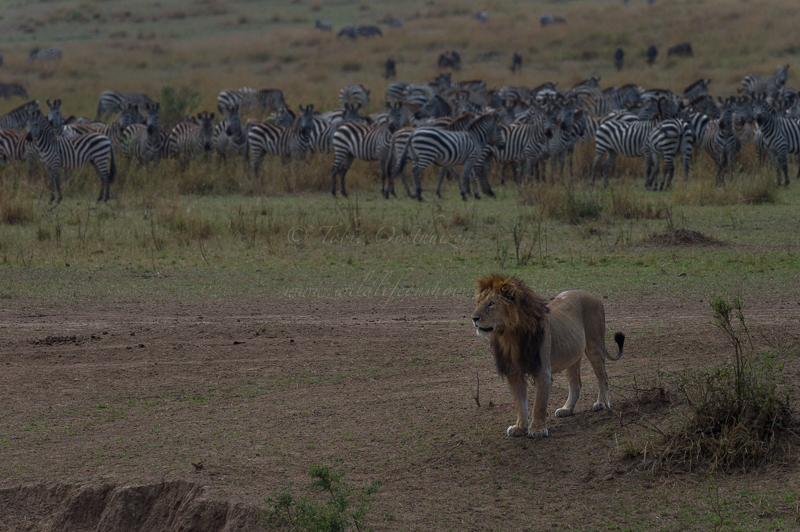 We went looking for them early afternoon. 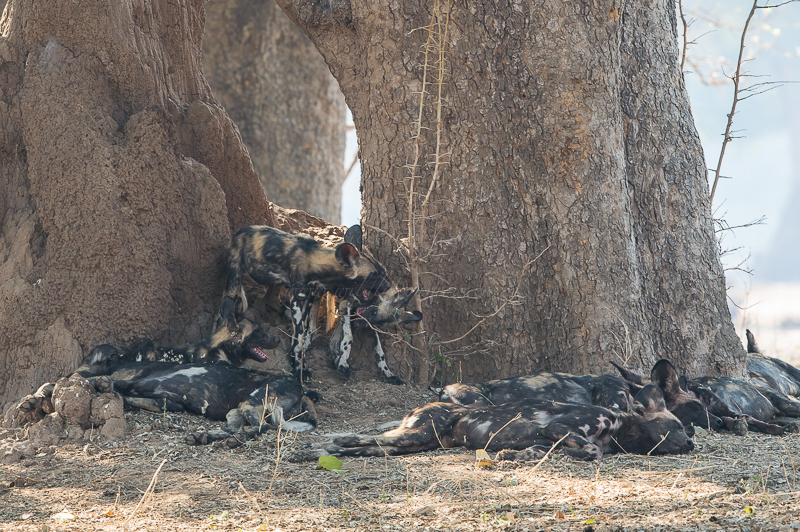 On the first afternoon we found them sleeping next to a small stream in the shade of some trees. 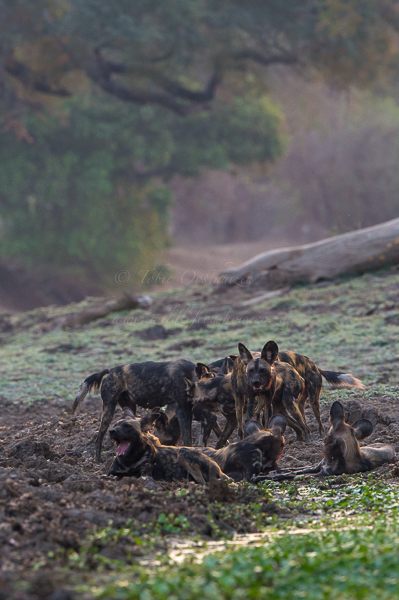 While the adults were resting the pups were fooling around with one another. 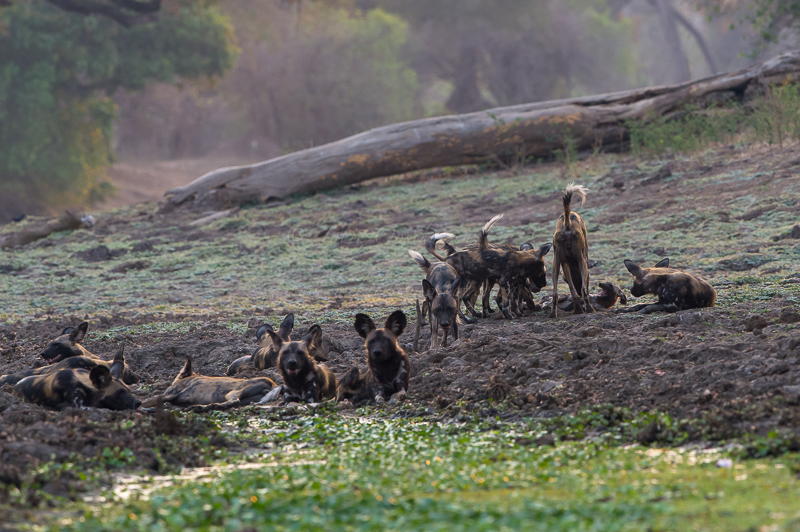 All of a sudden the whole pack got up, greeted one another and went down for a drink in the stream. 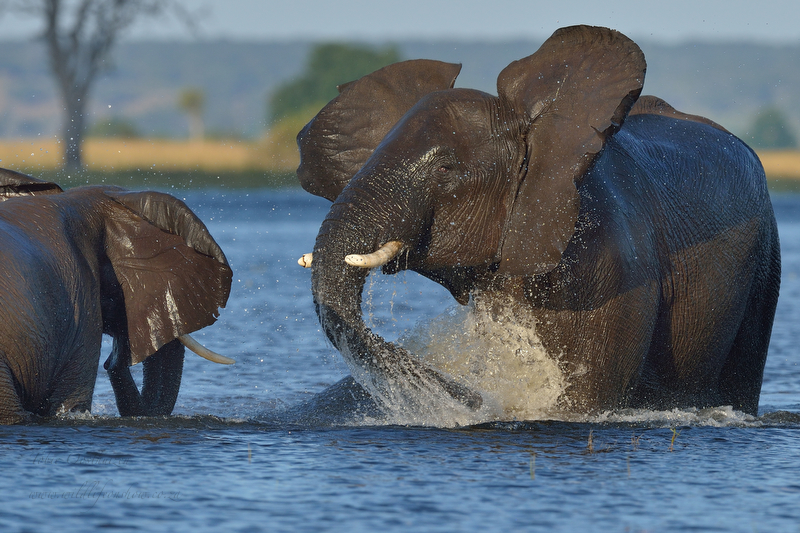 After spending some time playing in the water they headed off to hunt. 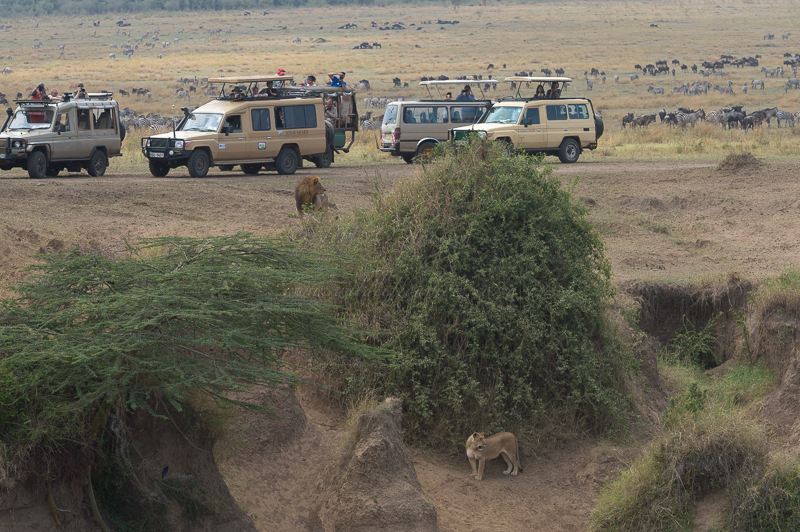 Obviously we could not keep up on foot but when we eventually caught up with them we noticed they killed a baboon. 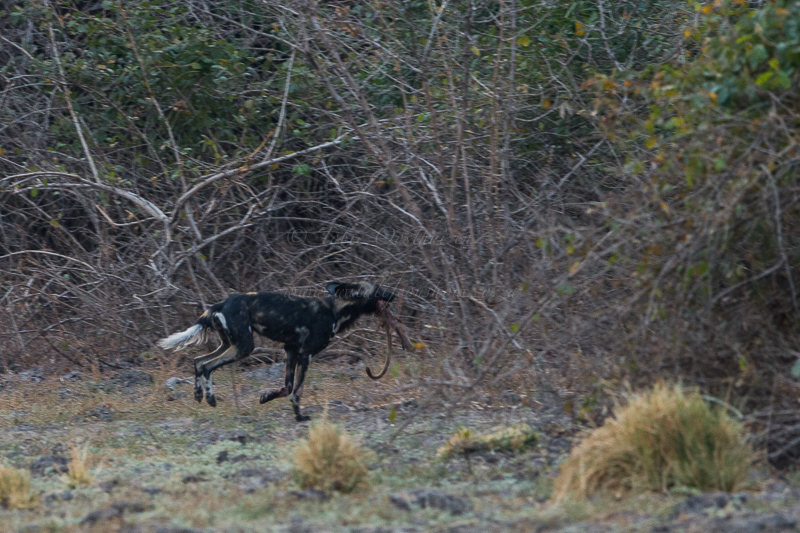 Although not a good image you can clearly see the baboon hind leg and tail this pup was running off with. 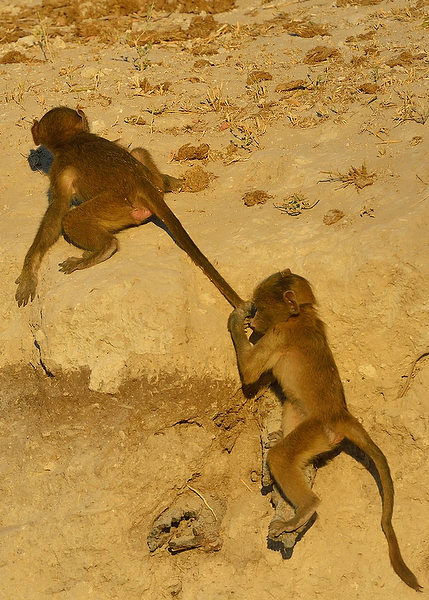 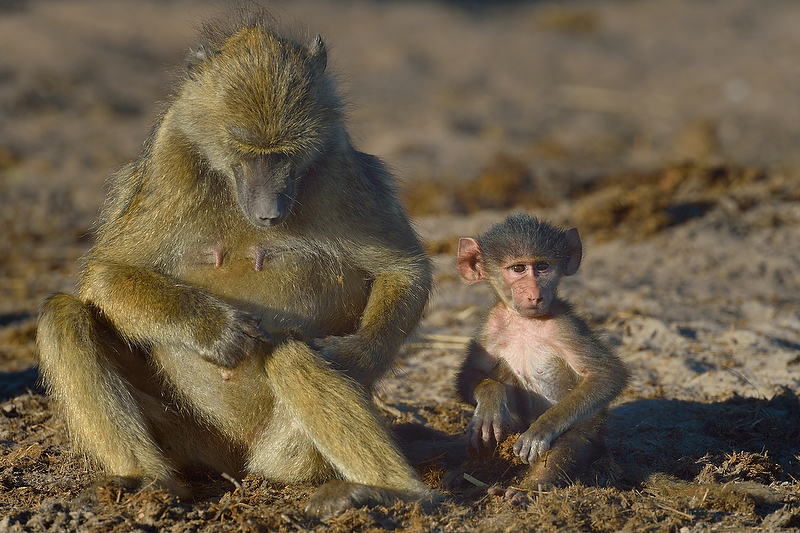 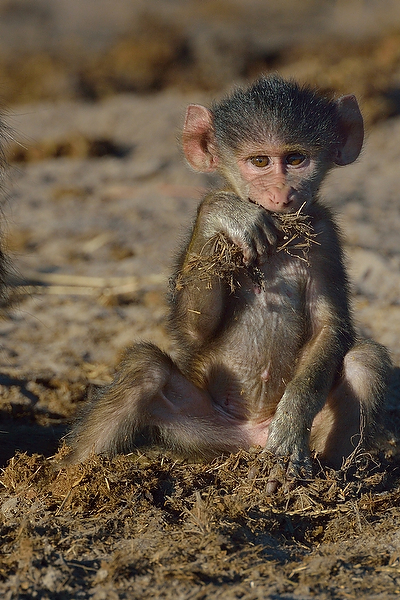 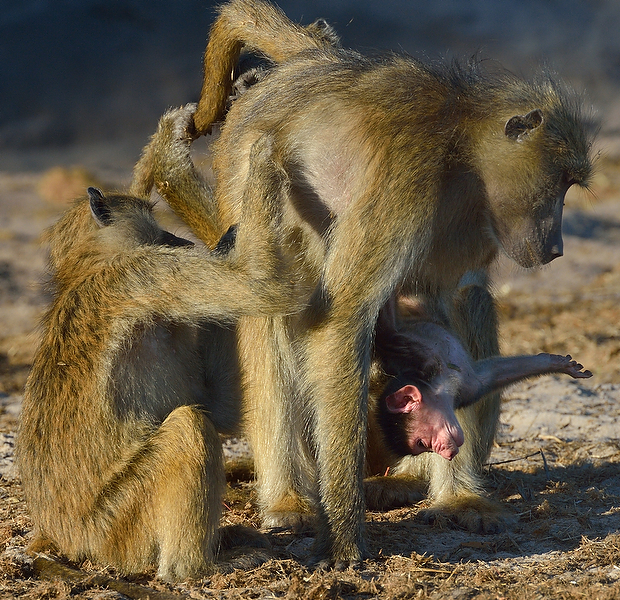 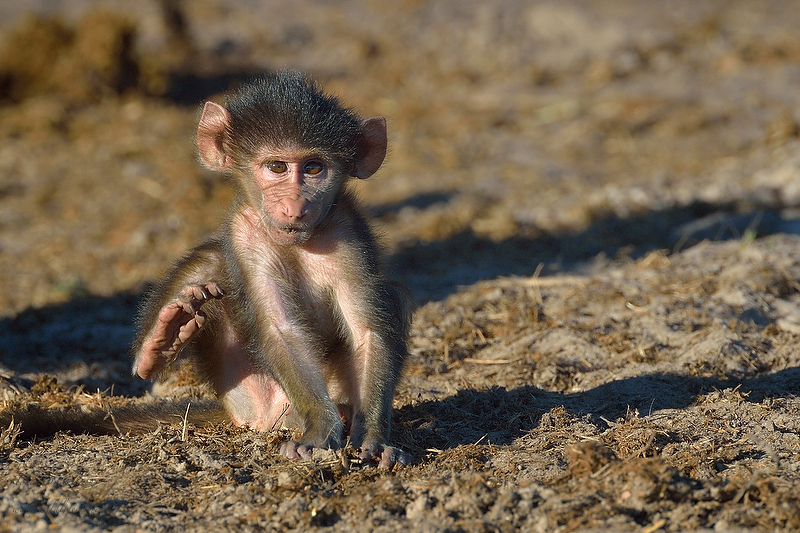 Apparently they use the opportunity of hunting baboon to expose the pups to the total hunt experience. 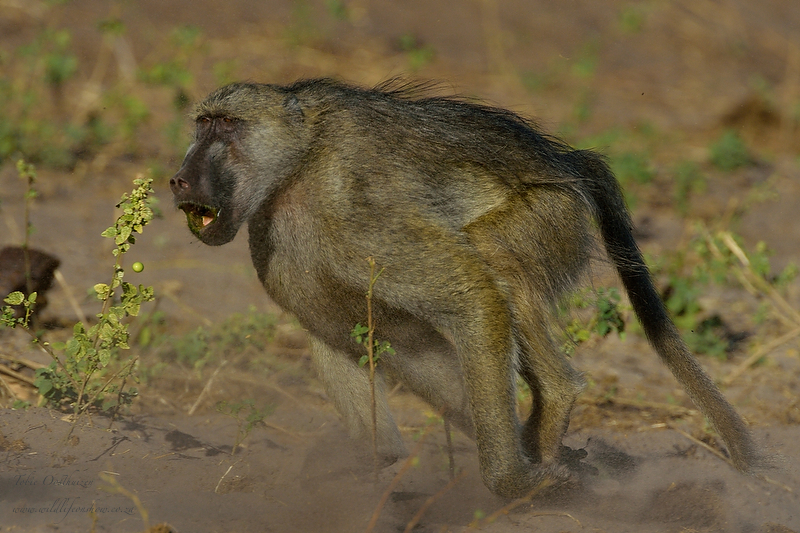 The baboons are not as fast and in this forrest environment with only very large trees around they only have to prevent the baboon getting into the trees. 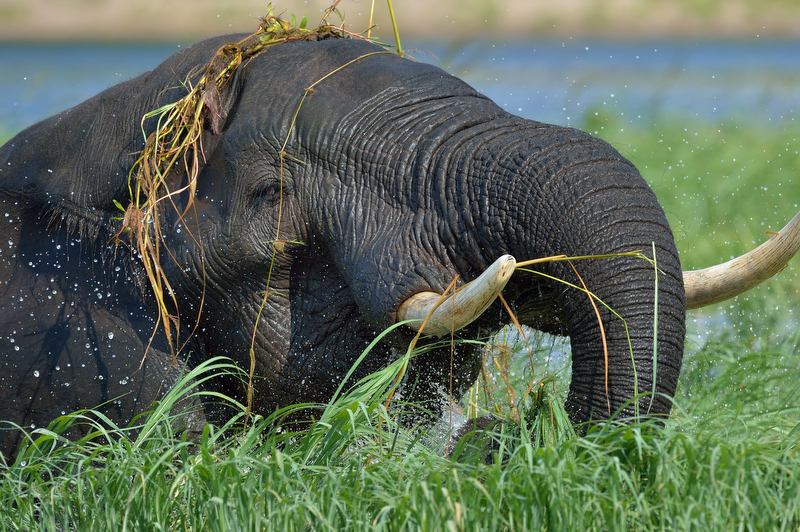 We all have been adding things to do to our personal bucket lists. 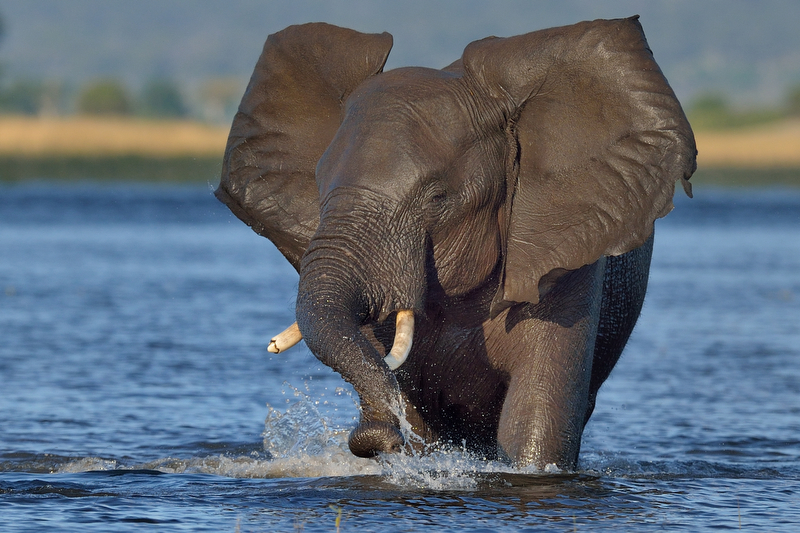 I had to go out and buy a larger bucket as my list just grew and grew and I never had the chance to ticks off items on the list. 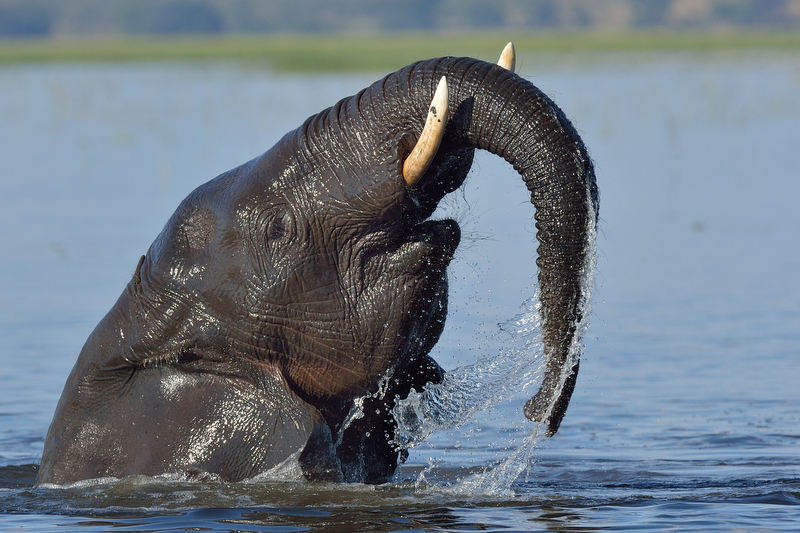 As this was mostly due to work commitments you can imagine my excitement when I finally retired at the end of February 2015. 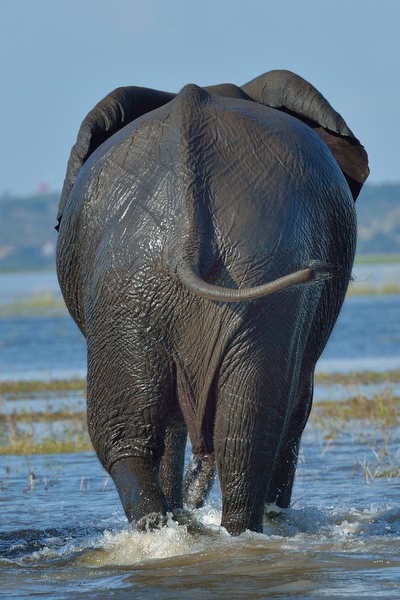 I immediately tackled my bucket list and started planning. 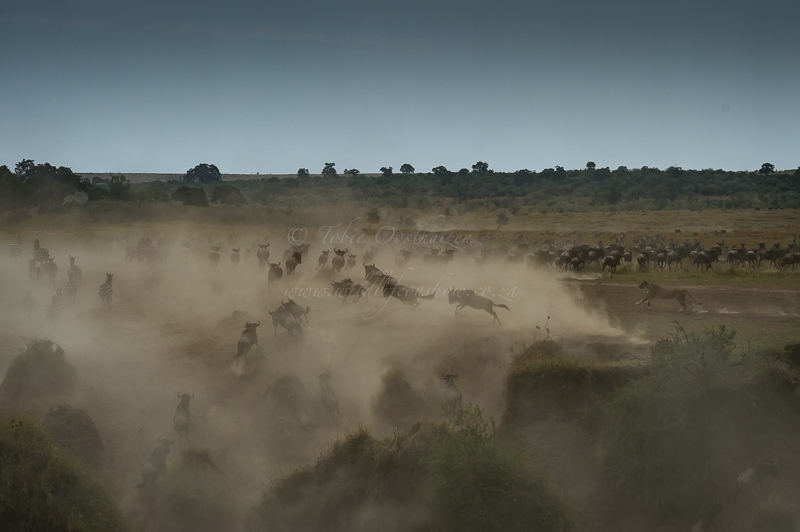 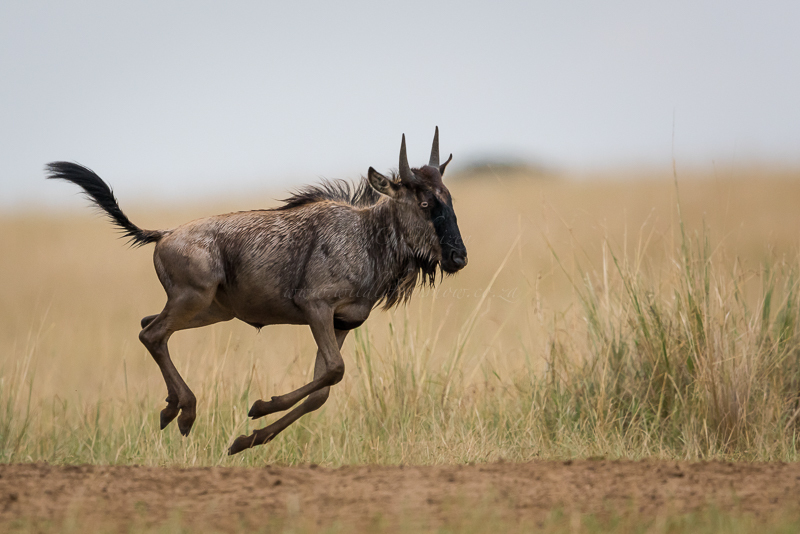 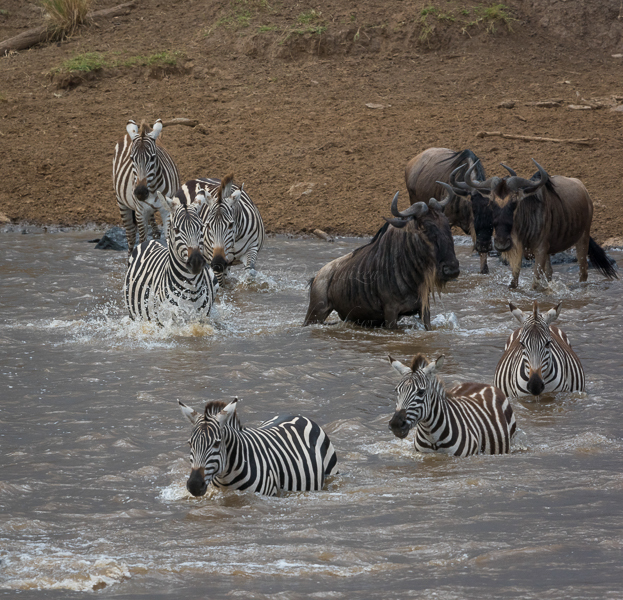 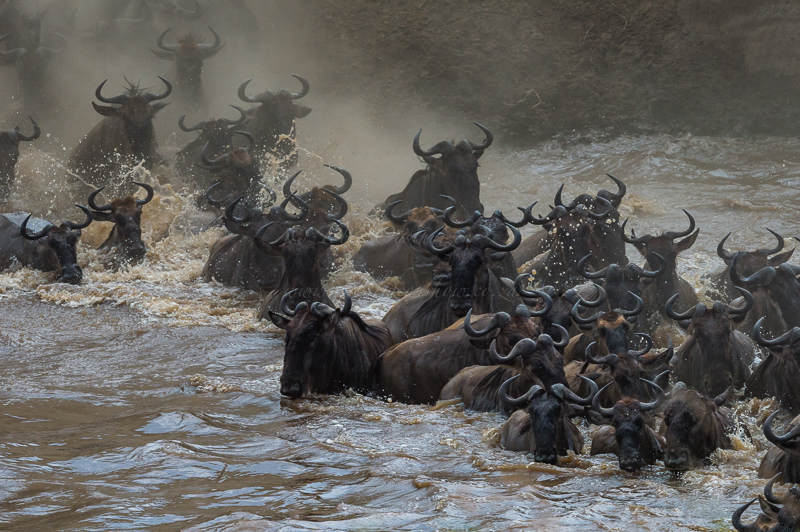 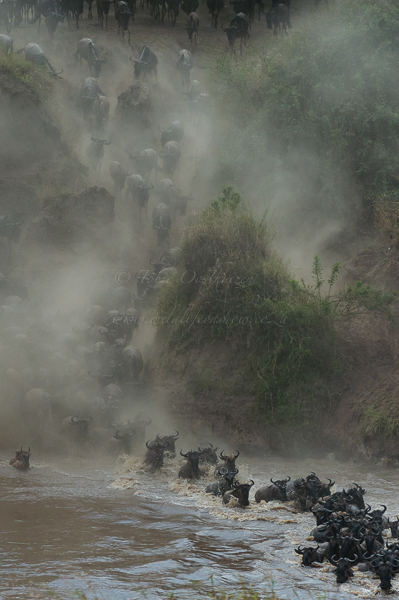 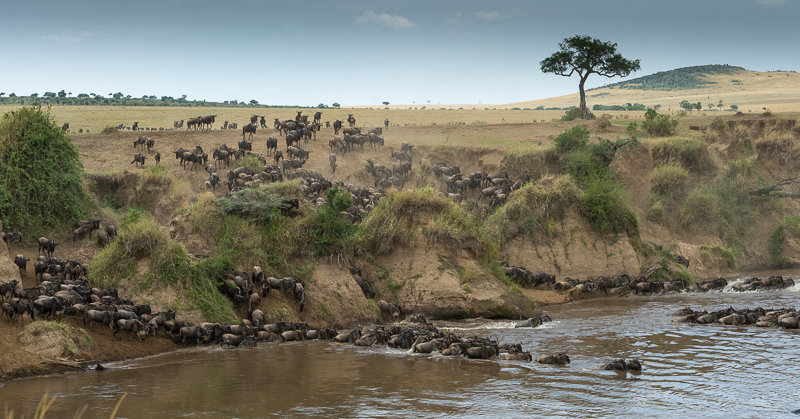 The first item on my list was experiencing the Wildebeest migration in the Masai Mara, Kenya. 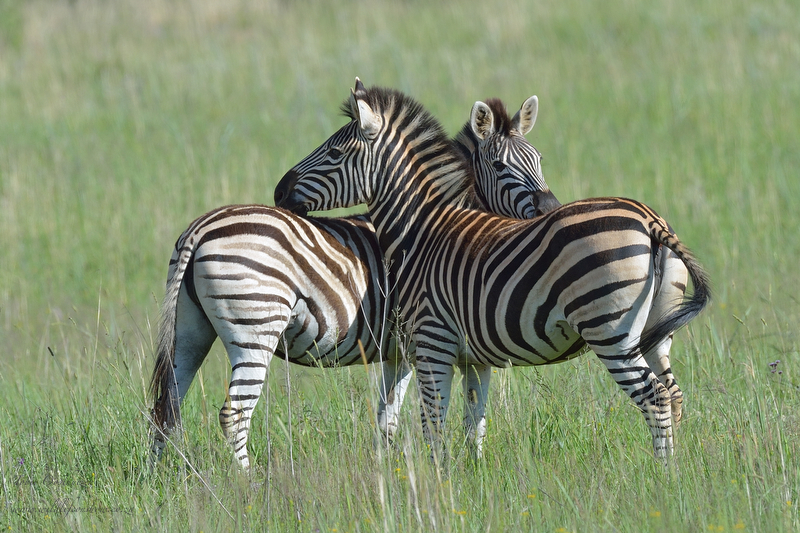 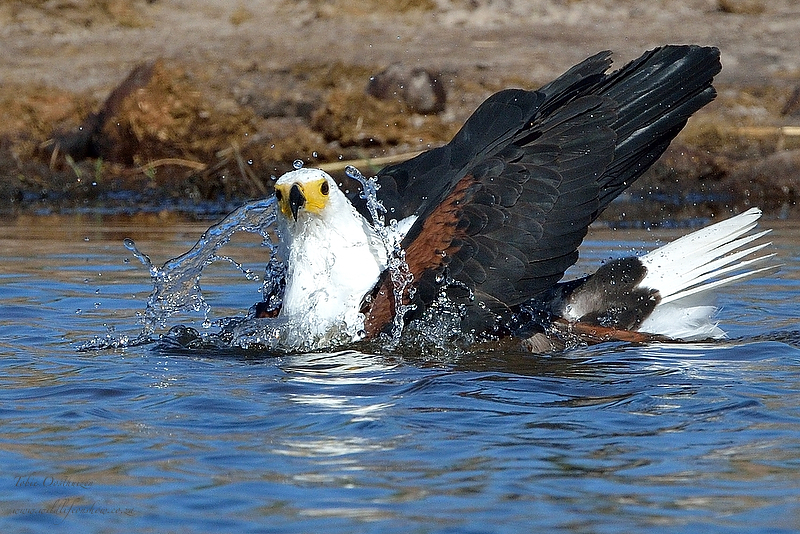 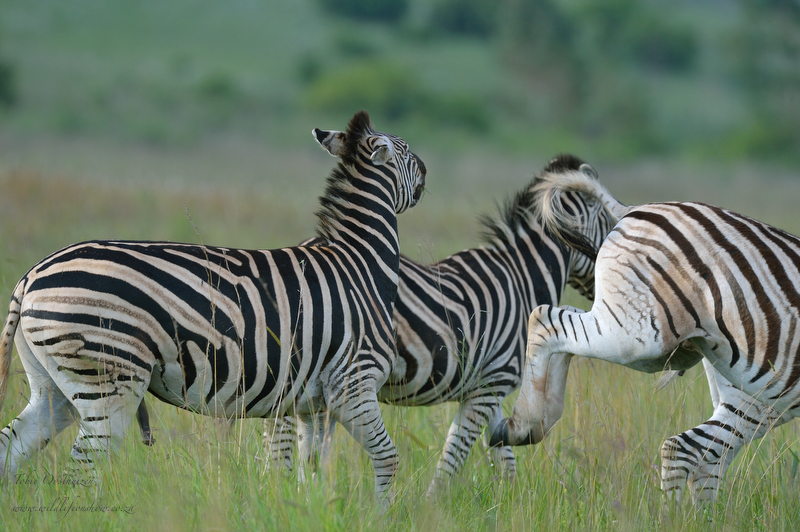 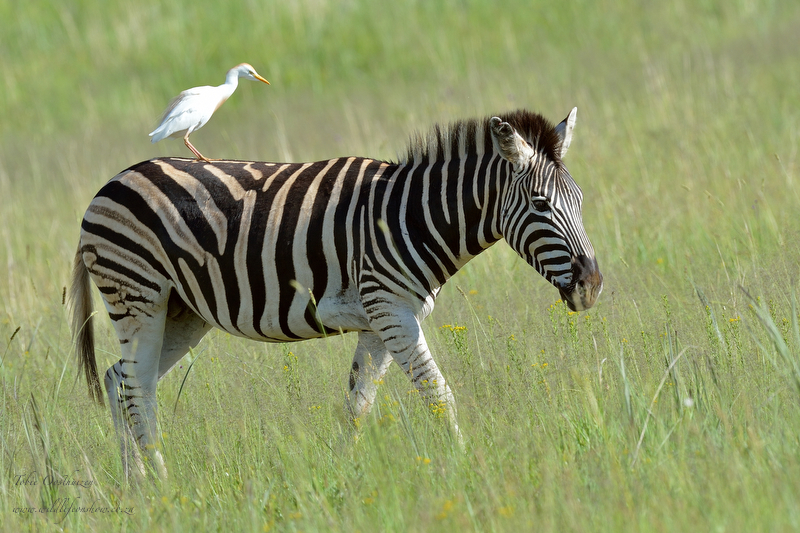 I booked a photographic safari with my old friends Lou Coetzer and Neal Cooper of CNP Safaris. 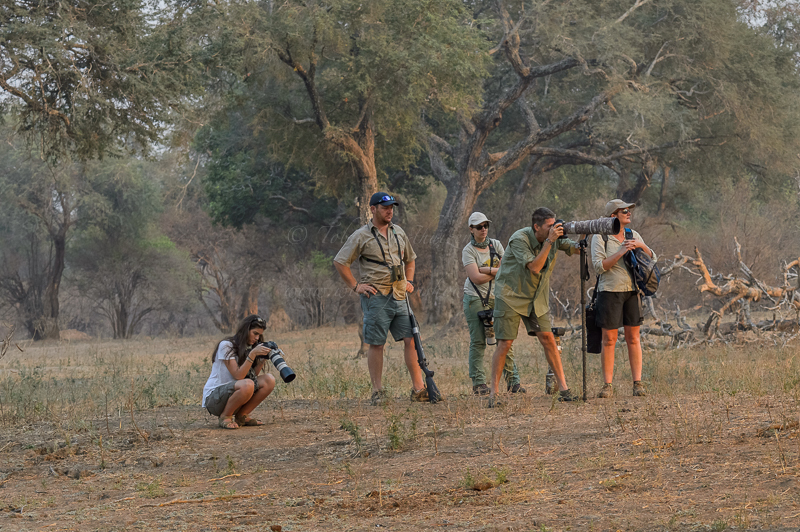 What an excellent bunch of guys and totally mind blowing experience. 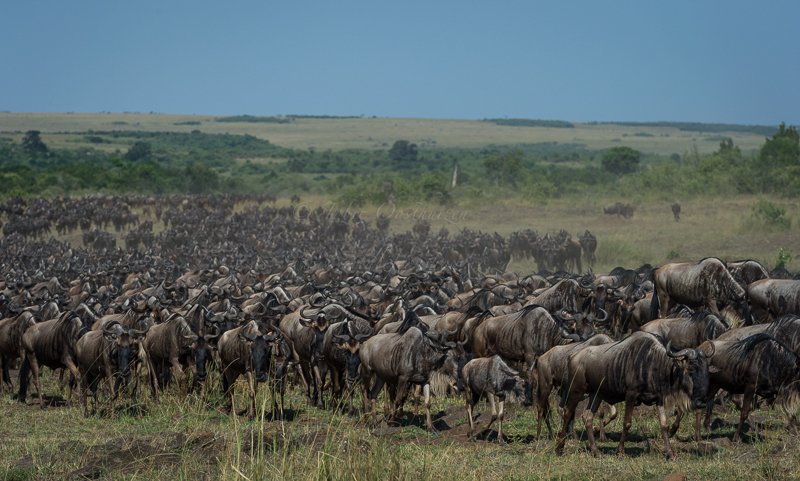 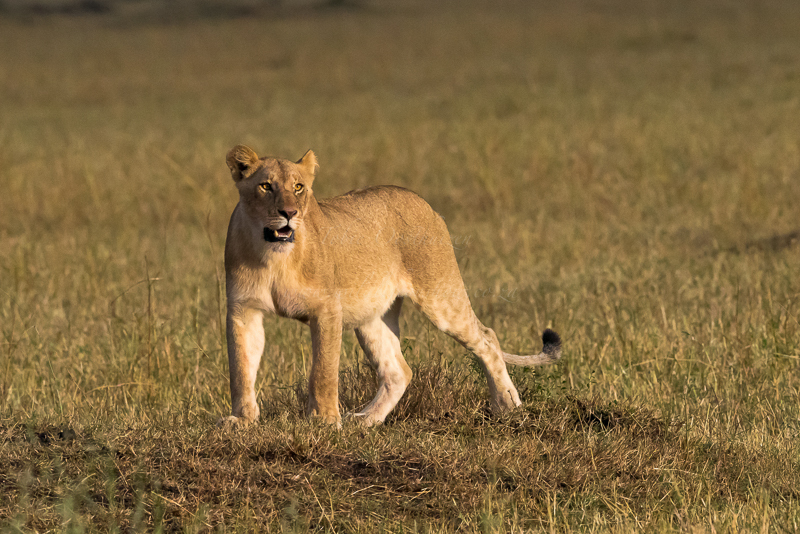 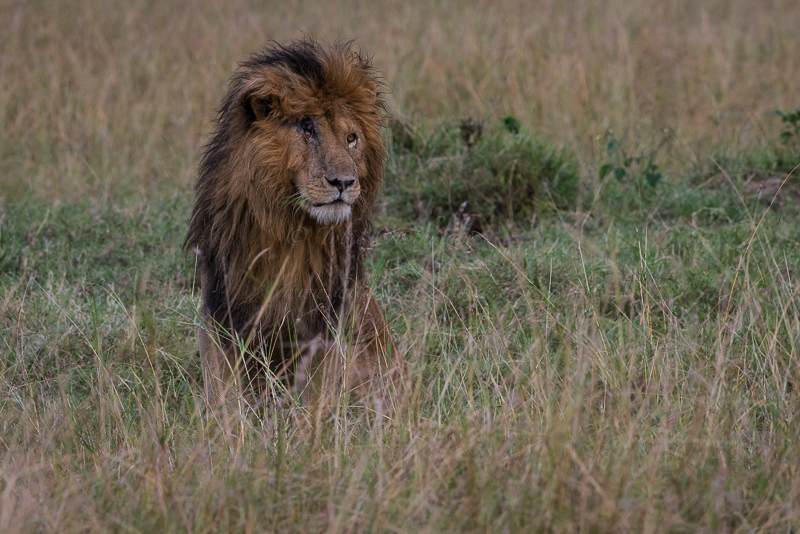 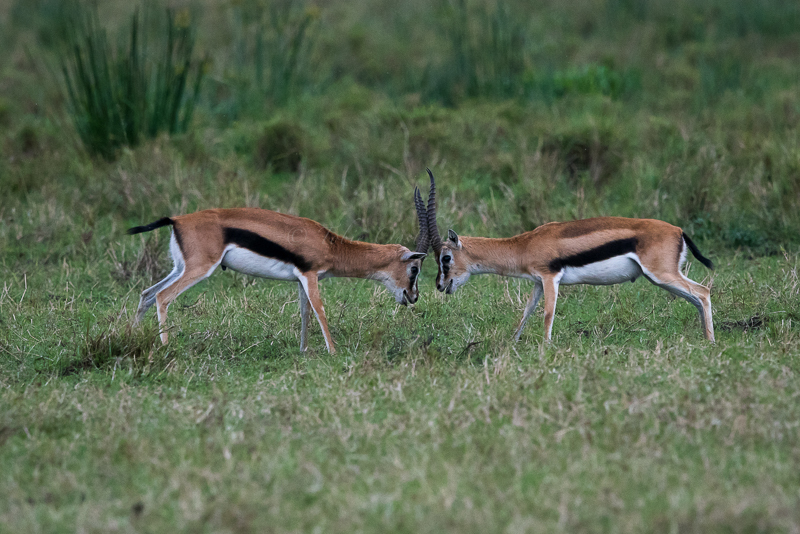 We arrived in the Mara at the beginning of September to an overcast sky with some stunning scenes of thousands of wildebeest and other antelope on the grass plains. 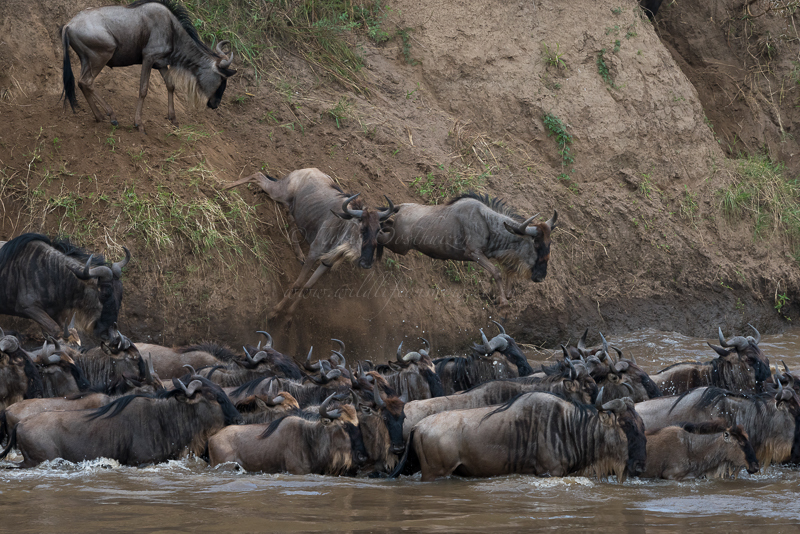 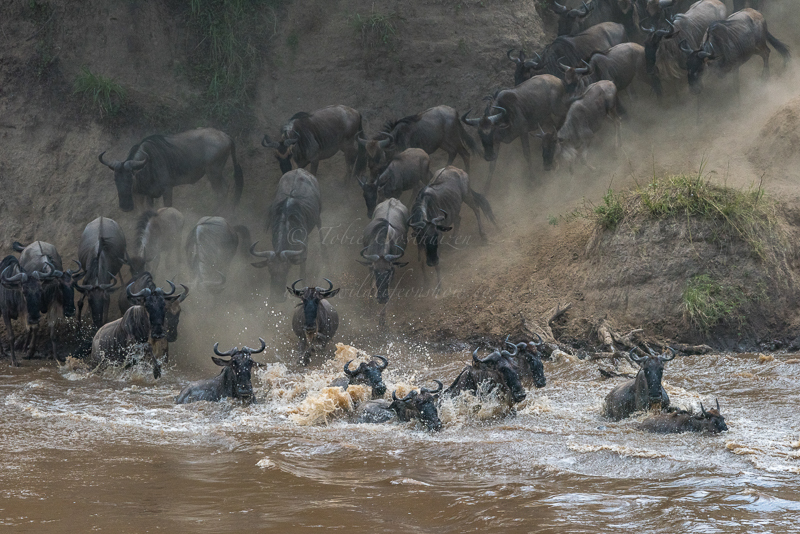 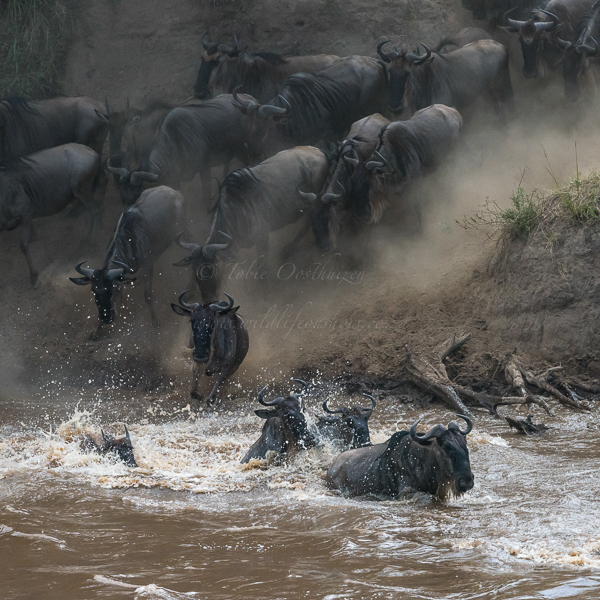 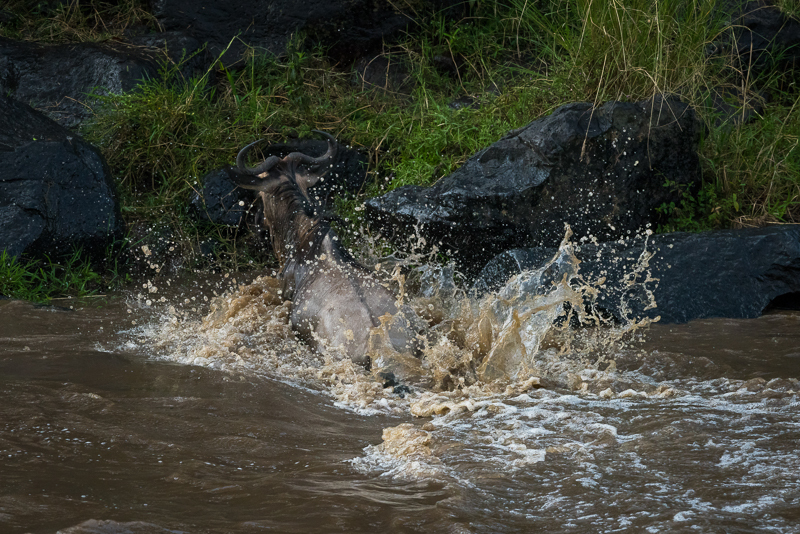 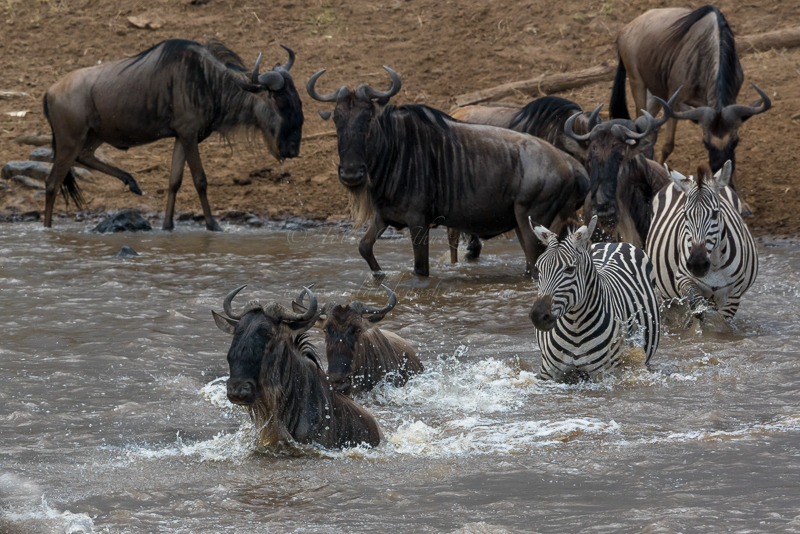 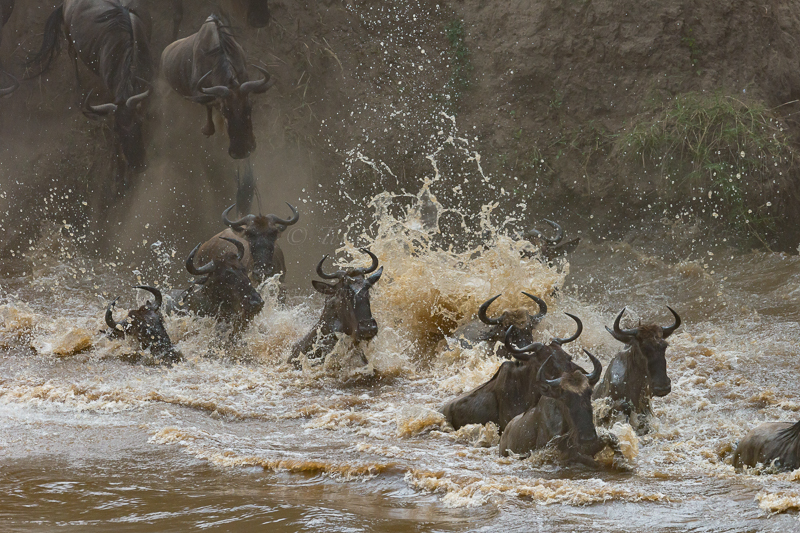 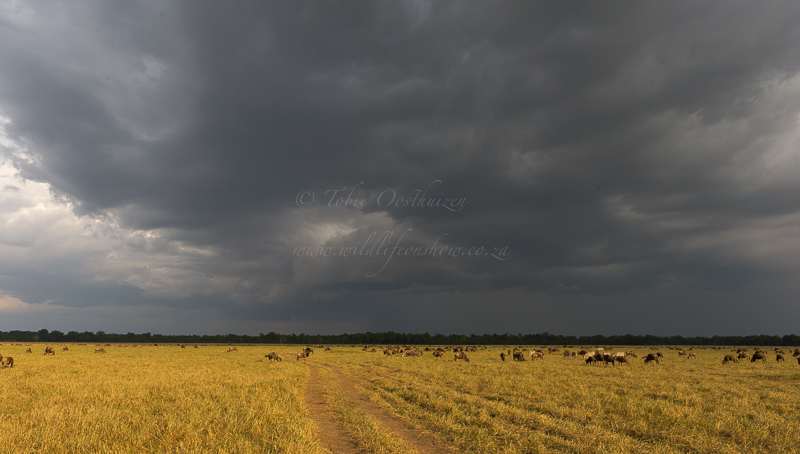 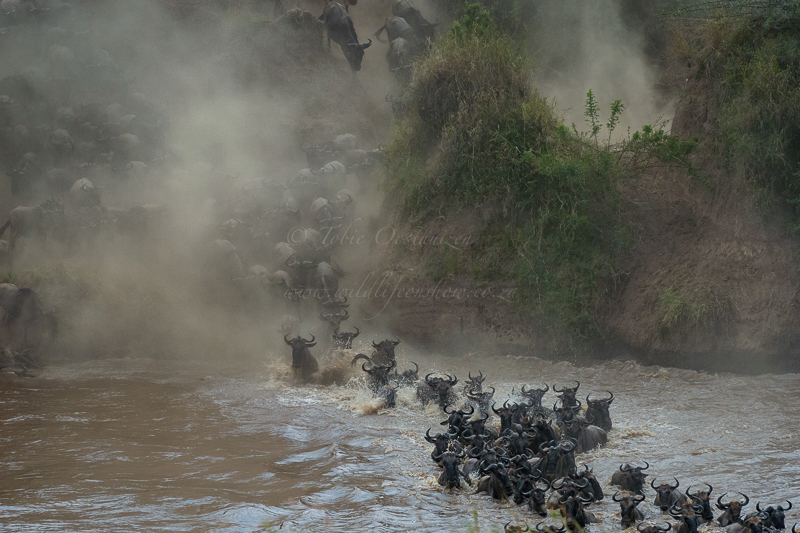 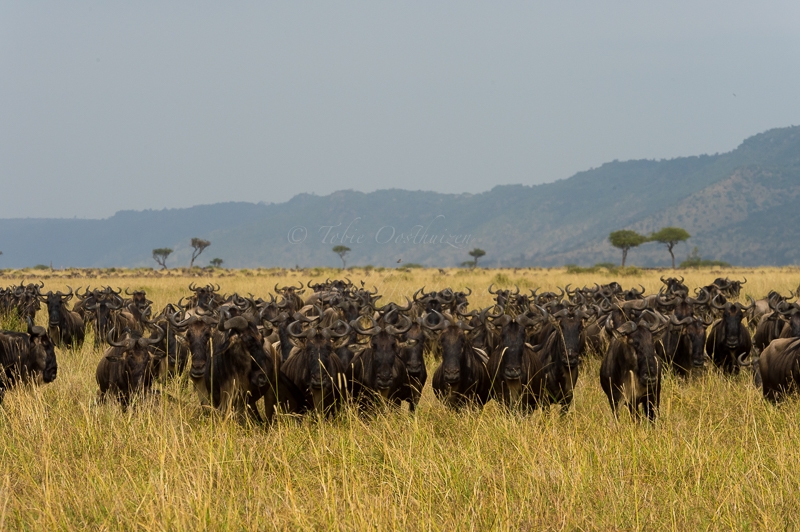 We were lucky to also witness some major Wildebeest crossings, although no crocodile interaction. 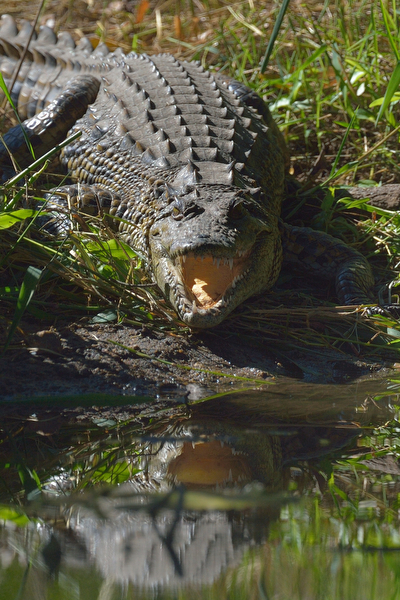 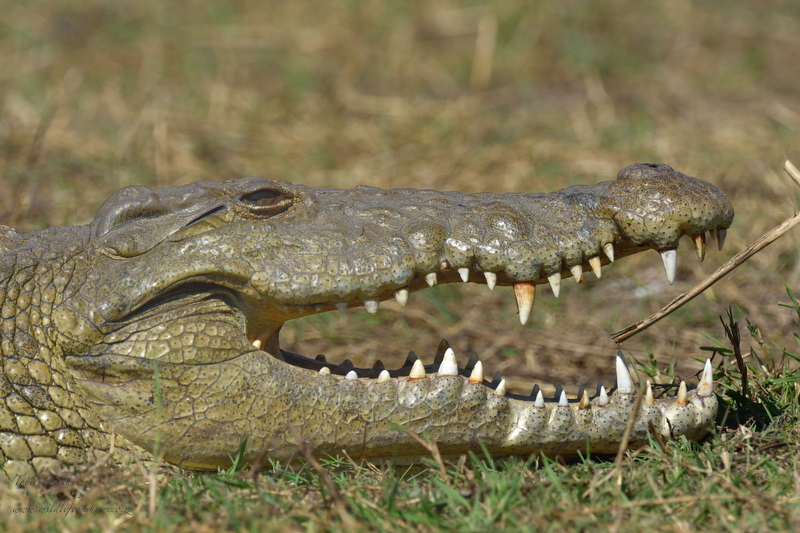 The crocs were so well fed and very relaxed during the week I spent there. 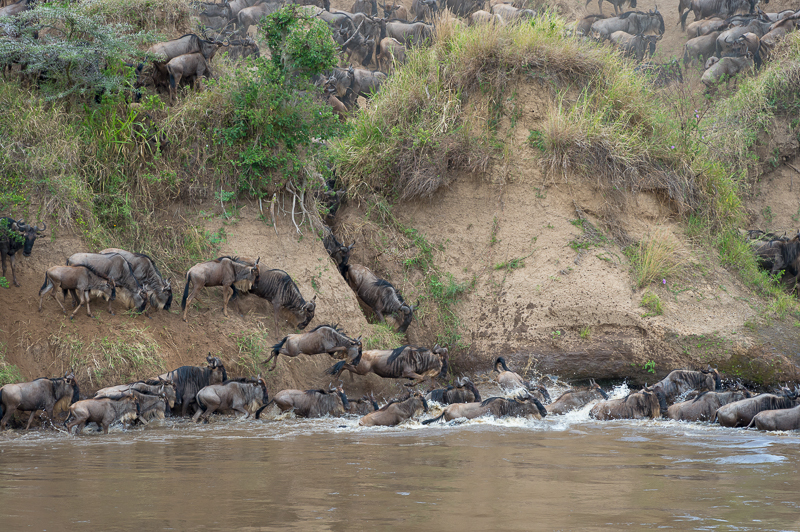 I was amazed by the number of wildebeest crossing the Mara River looking for fresh grazing and the way they (eventually) cross the river. 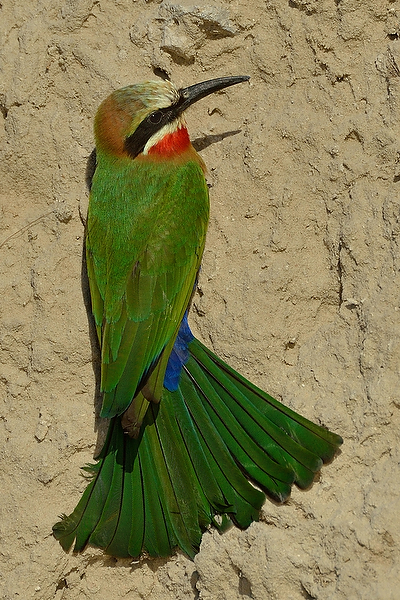 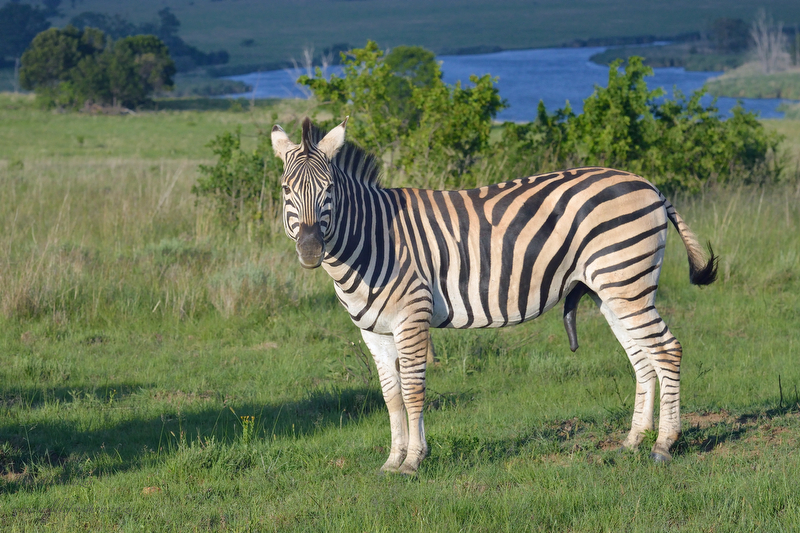 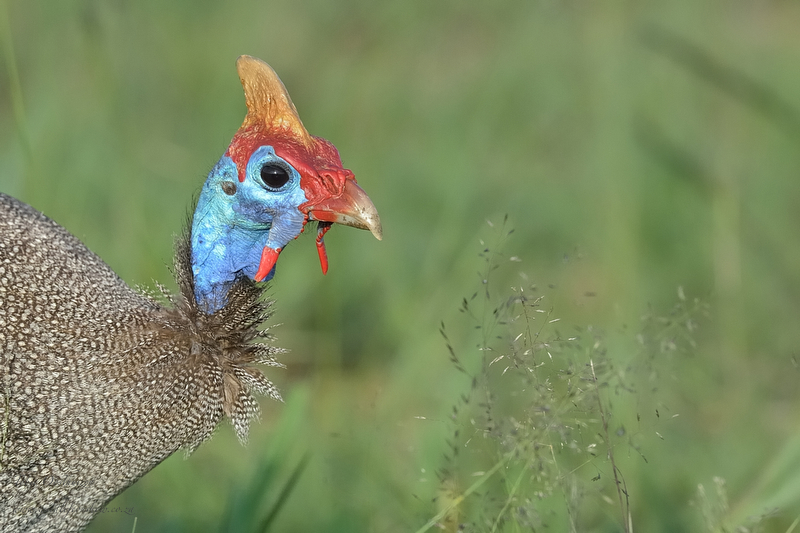 Although we all go to the Mara for the crossings there are some stunning other wildlife around. 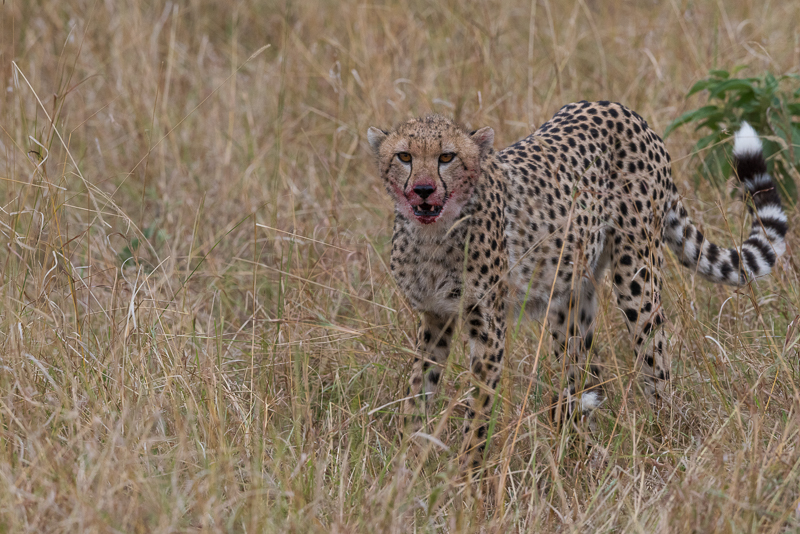 I will post different posts on specific Mara sightings so please feel free to return and check for updates. 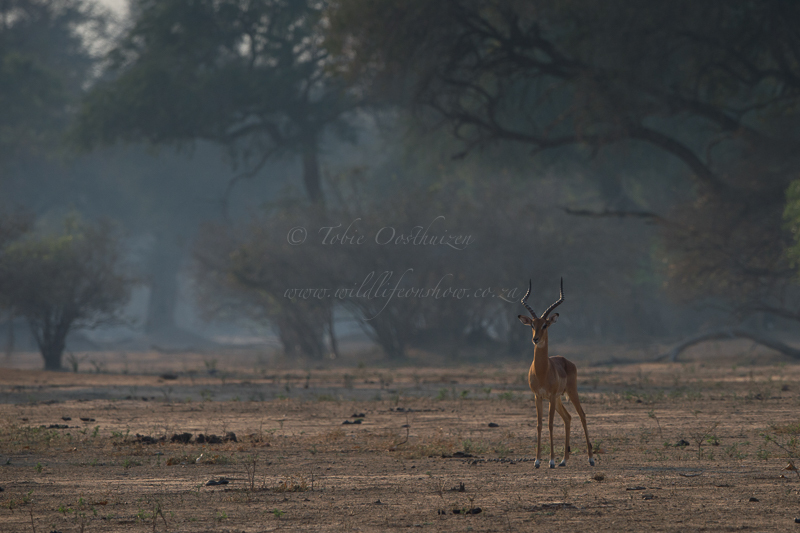 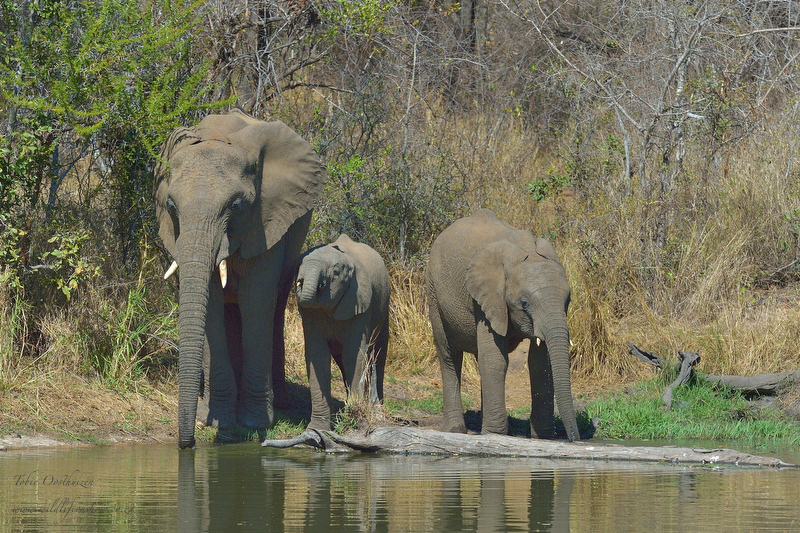 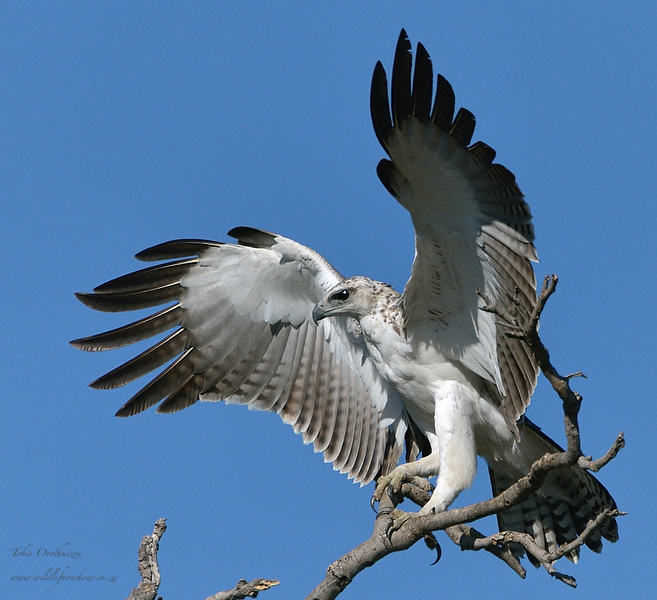 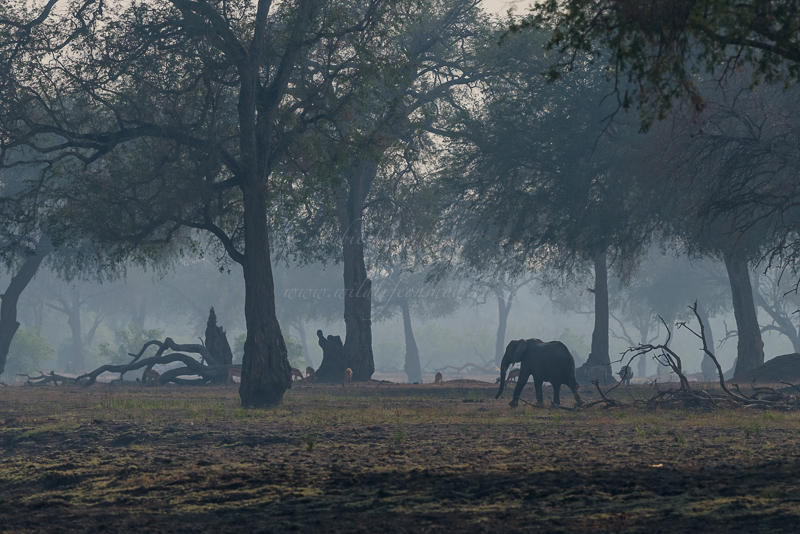 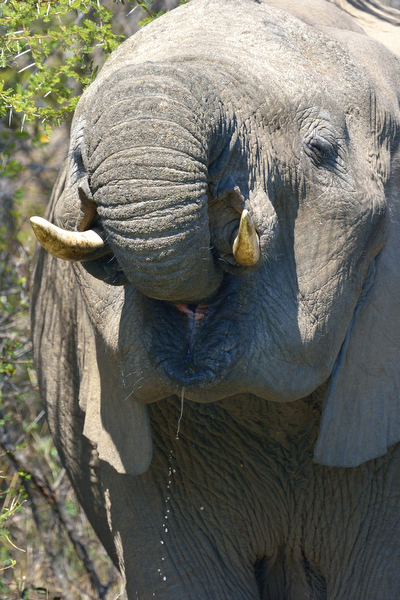 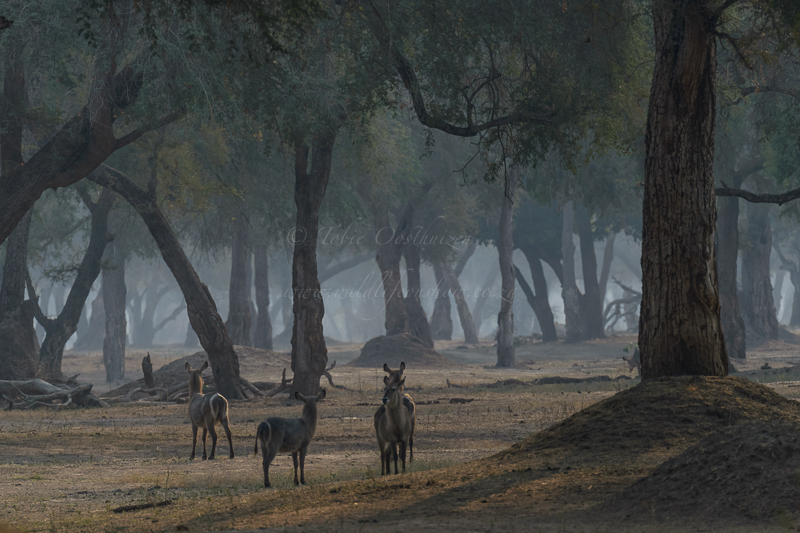 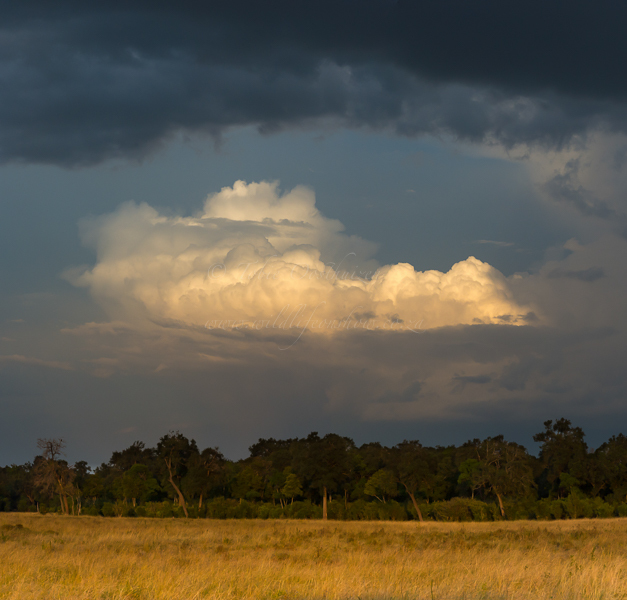 I have recently been to Kruger National Park for a few short but very nice visits. 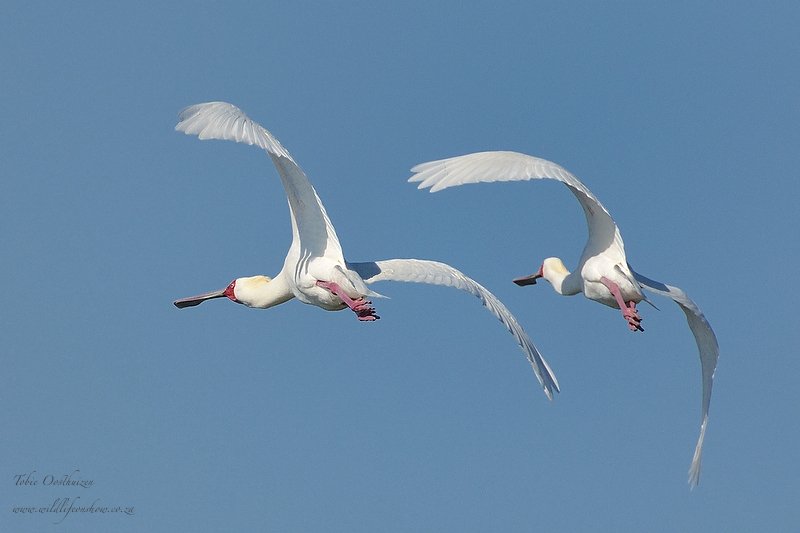 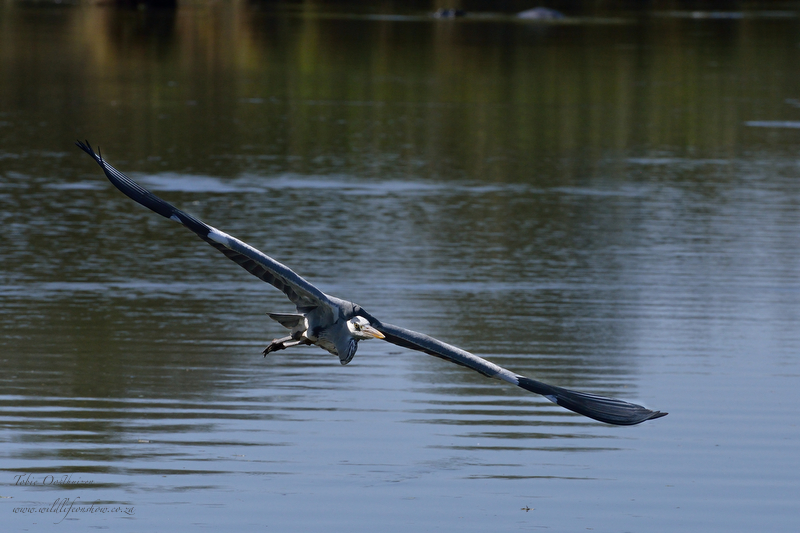 As Lake Panic, just outside Skukuza, has always been one of my favorite bird hides I have obviously made sure that I also stopped there for some excitement. 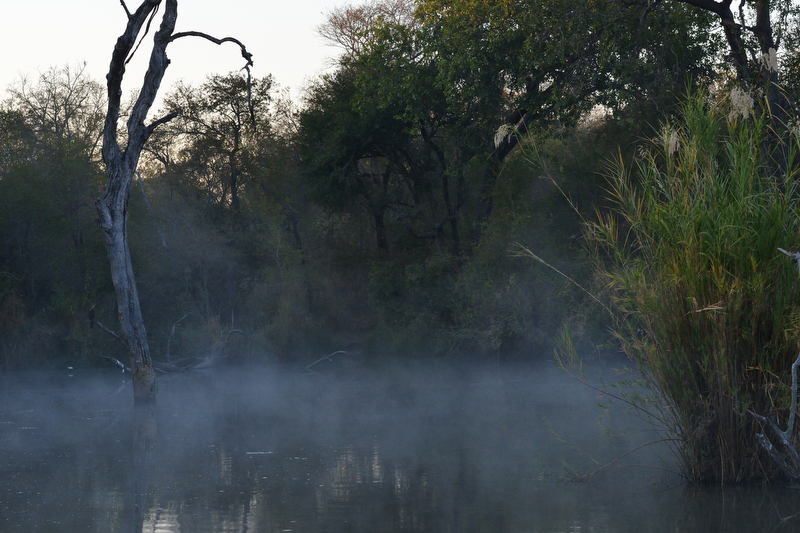 The first trip was during June 2013 and early morning it is still very cold. 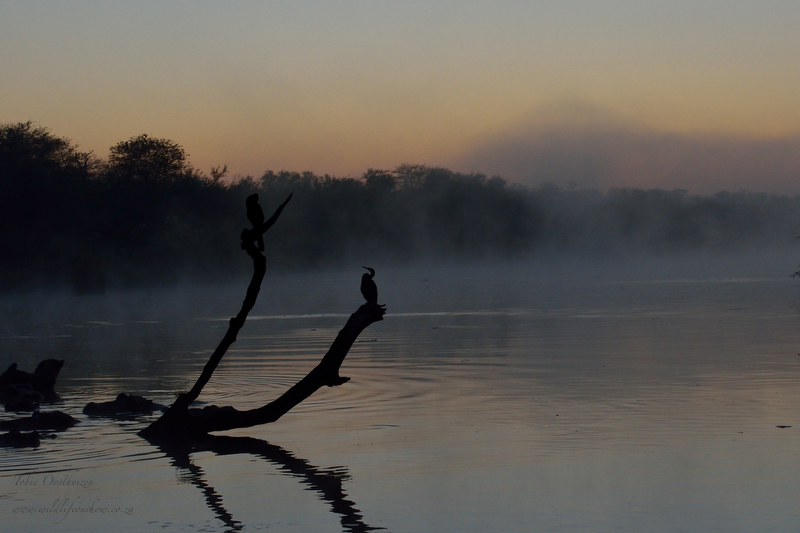 If you leave Skukuza as the gates open you get to Lake Panic just before sunrise. 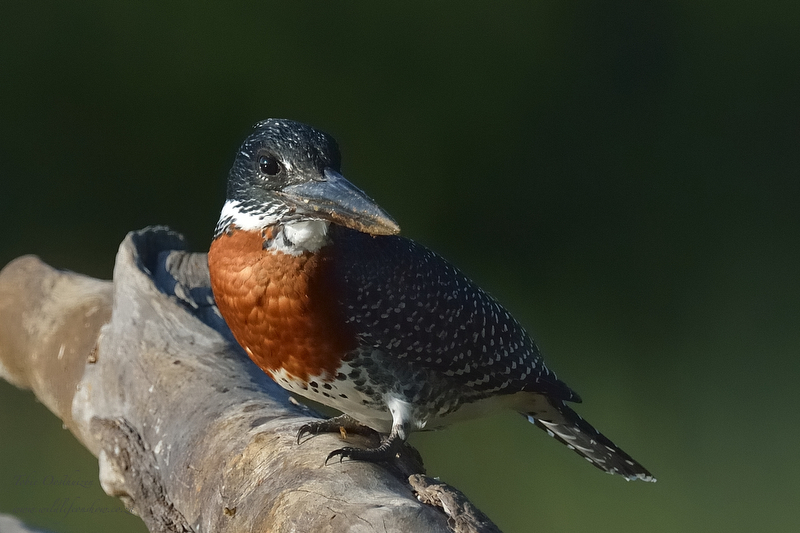 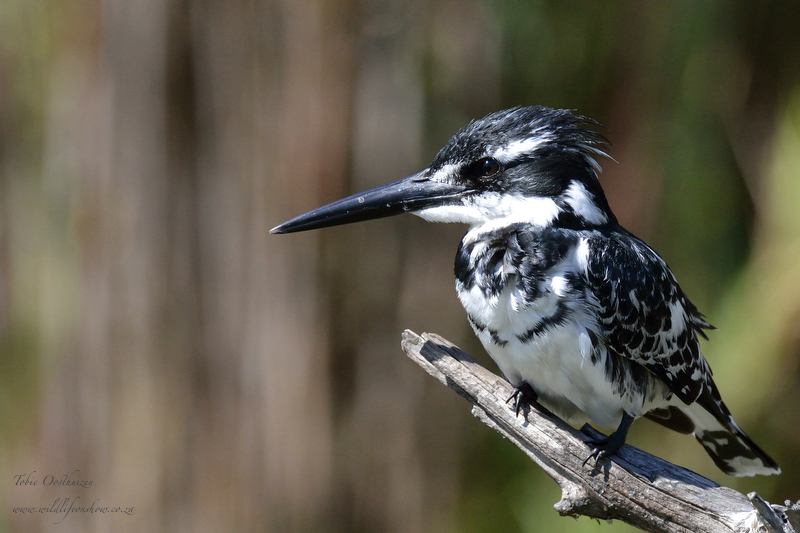 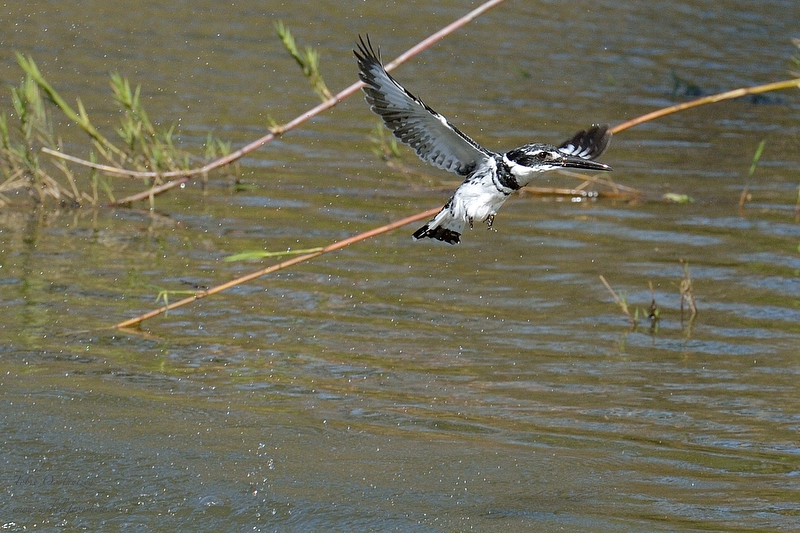 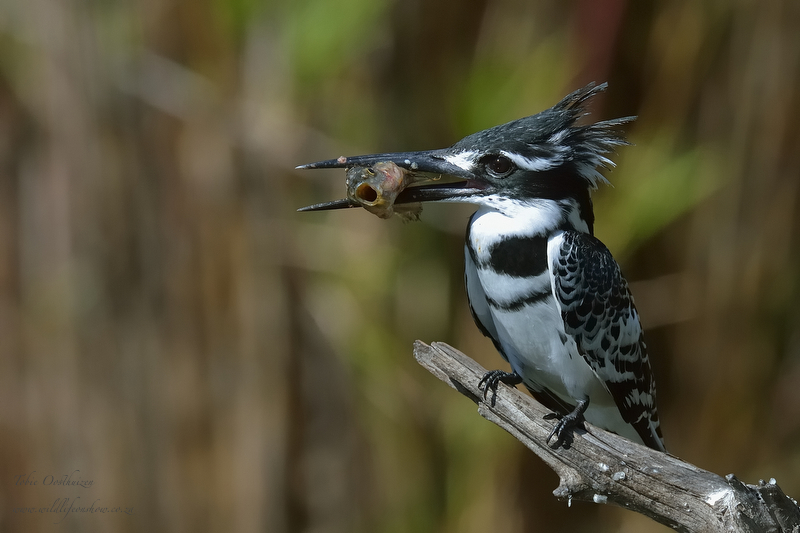 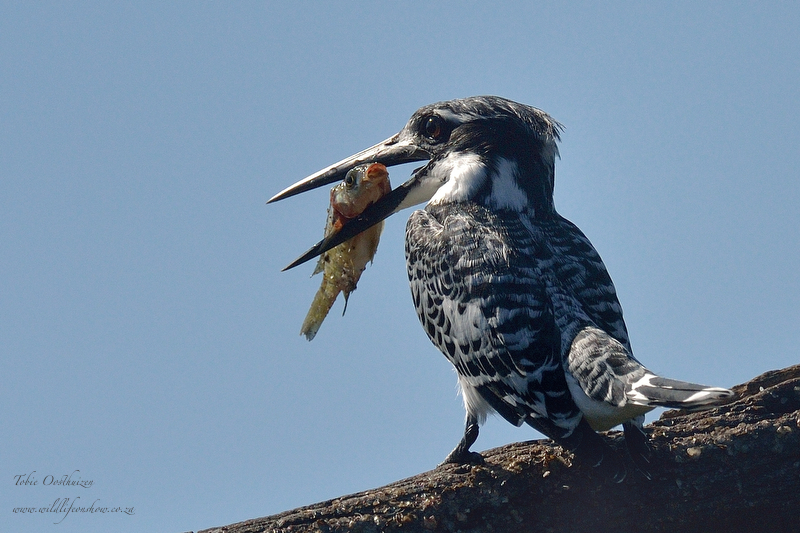 The next visitors are normally the Pied Kingfishers. 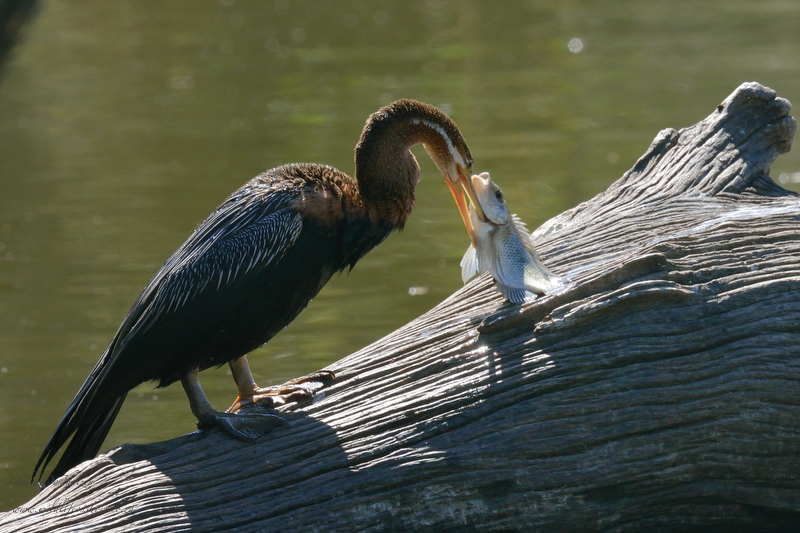 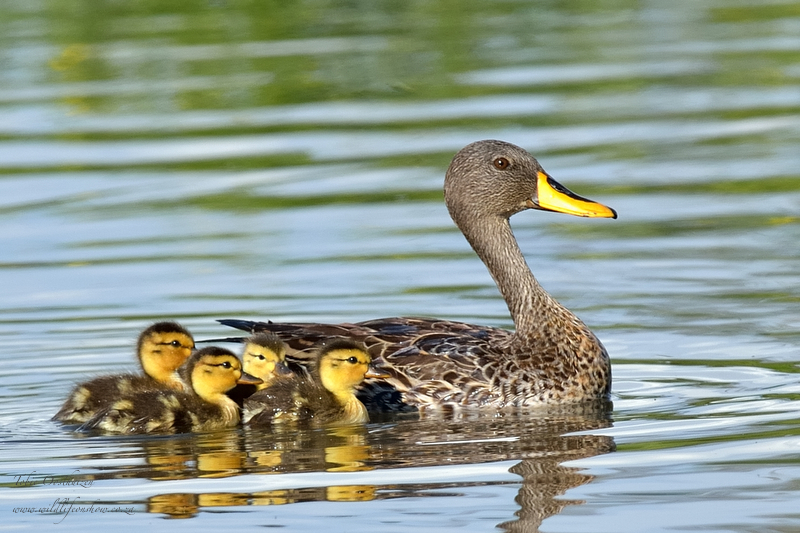 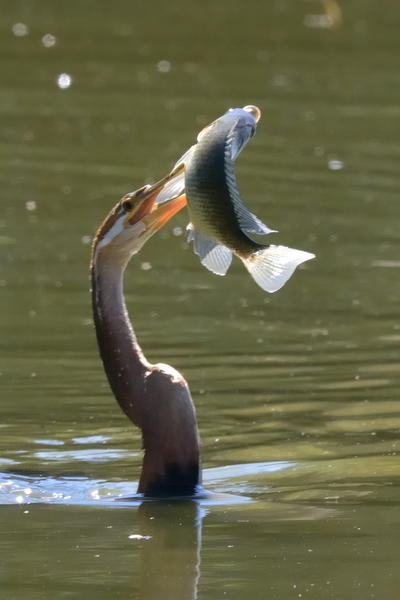 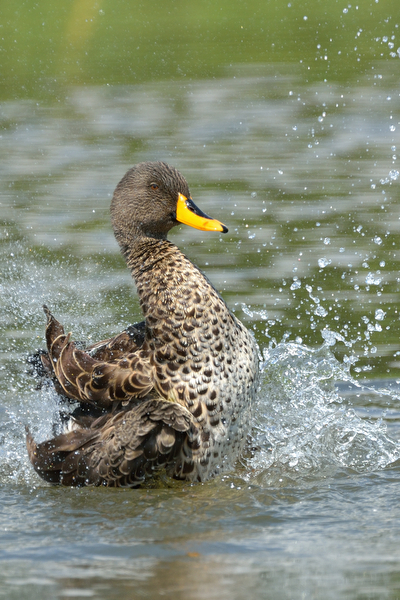 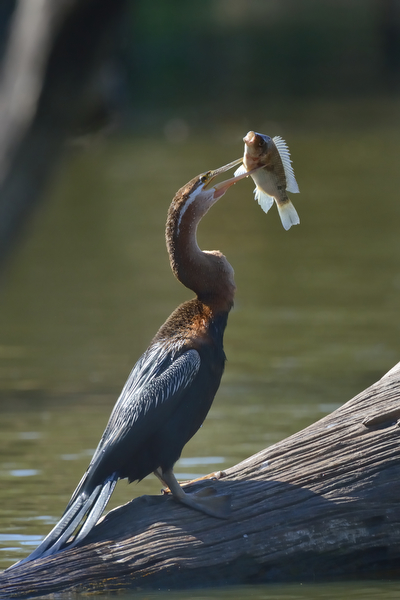 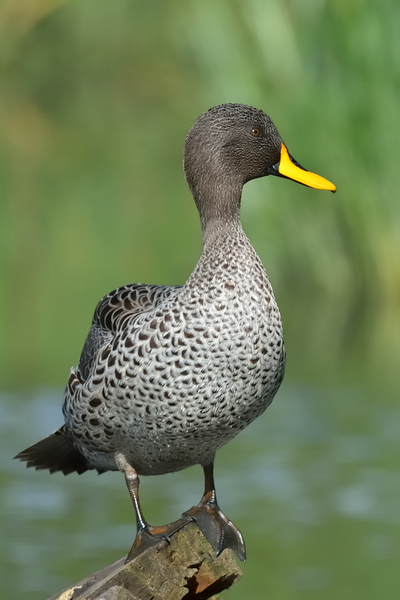 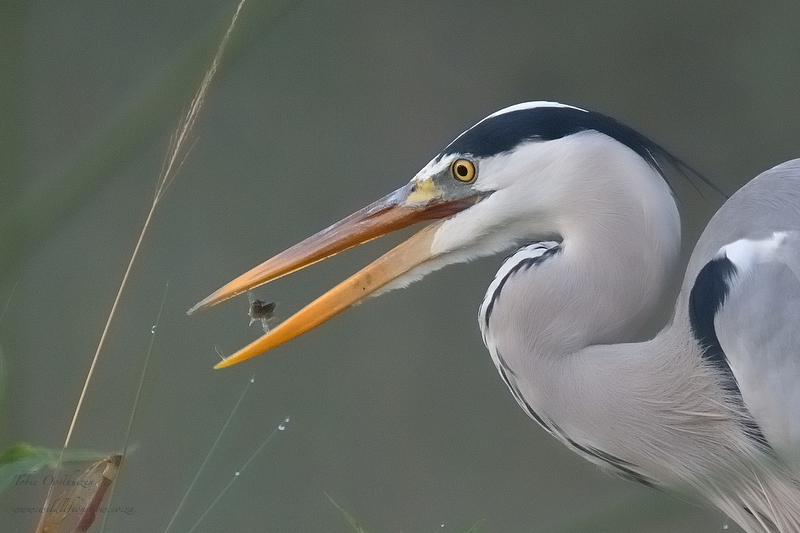 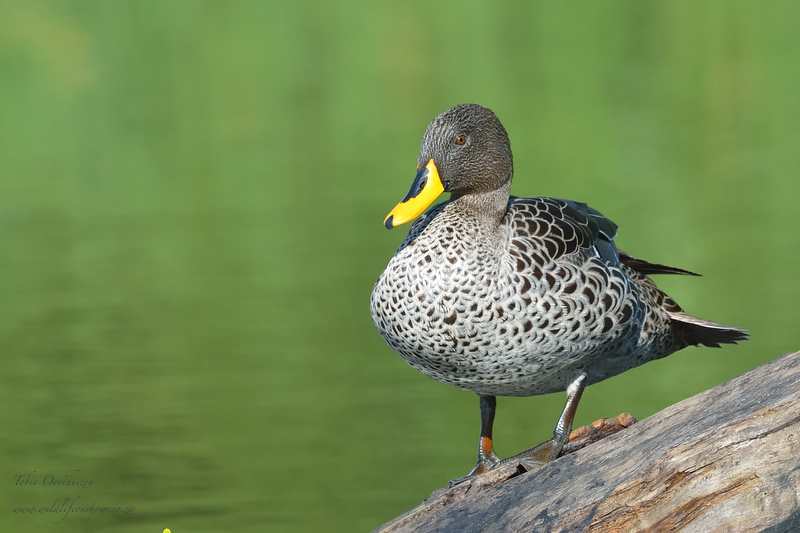 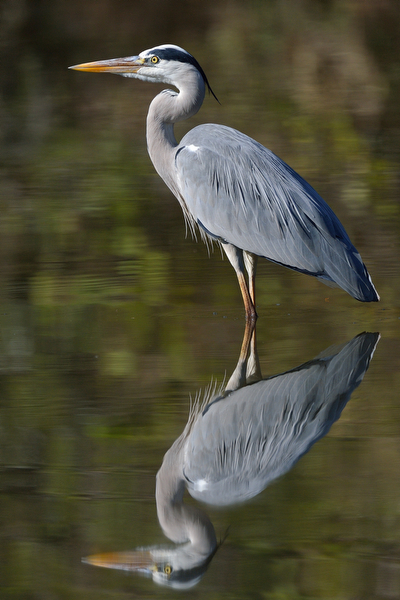 They sit and watch for fish hover above the water and then dive into the water to catch the fish with their strong beak. 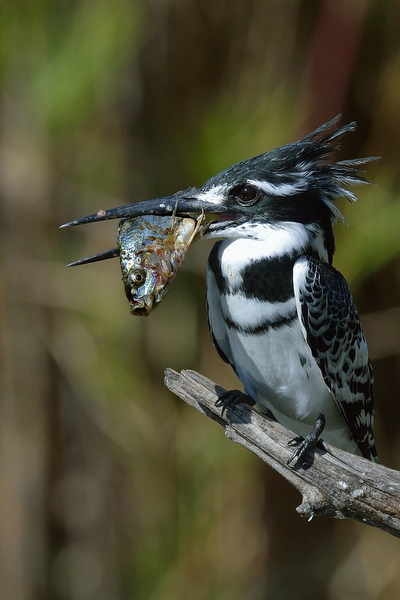 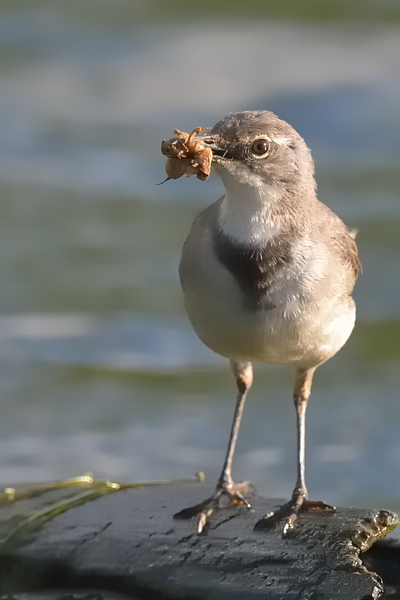 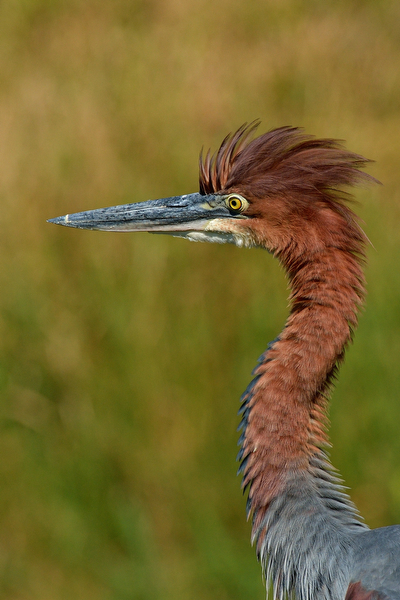 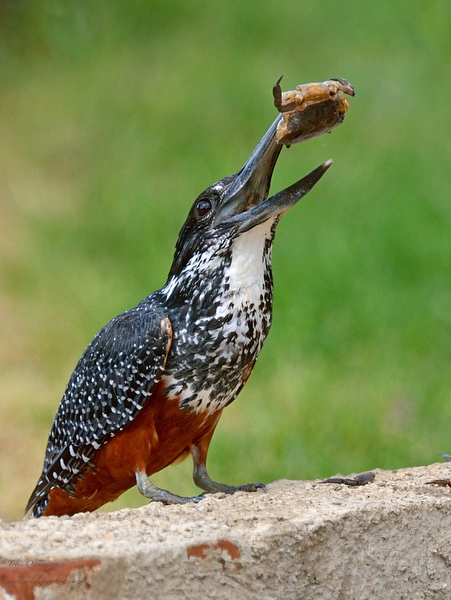 They then fly to a branch where they start knocking the hell out of the fish. 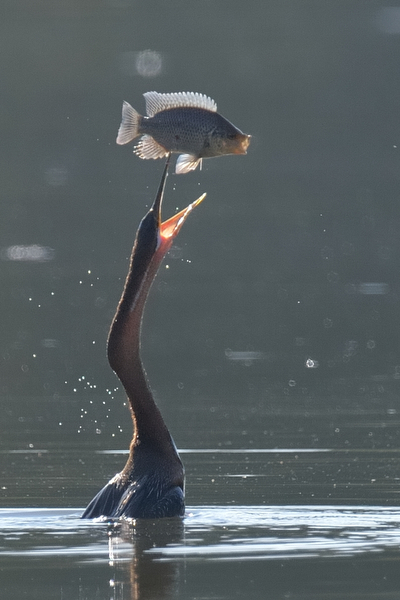 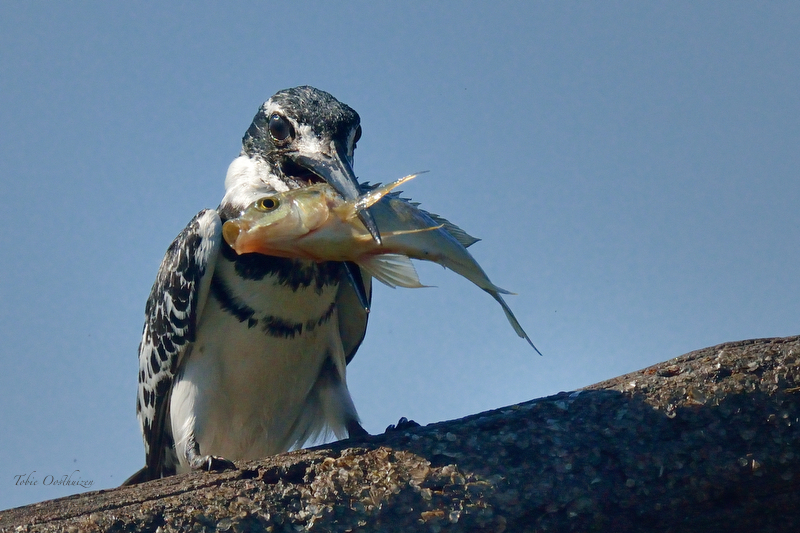 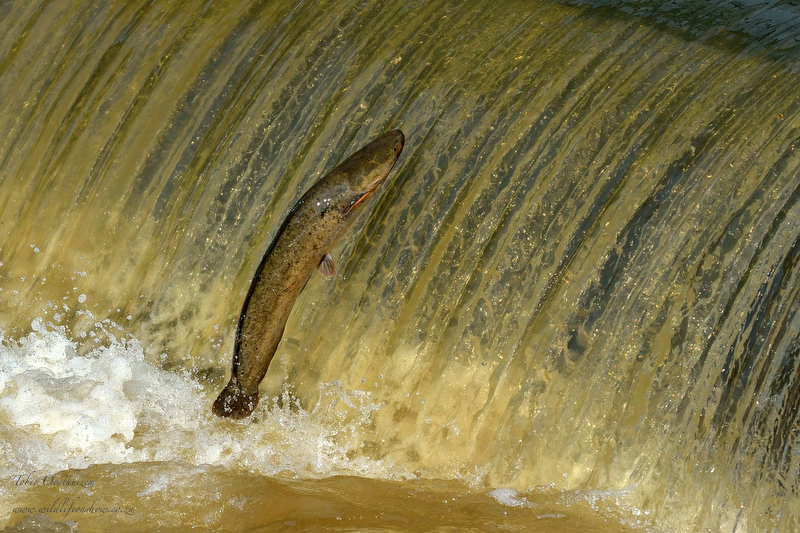 This is done to firstly kill the fish but secondly also to remove the scales before commencing to swallow the catch. 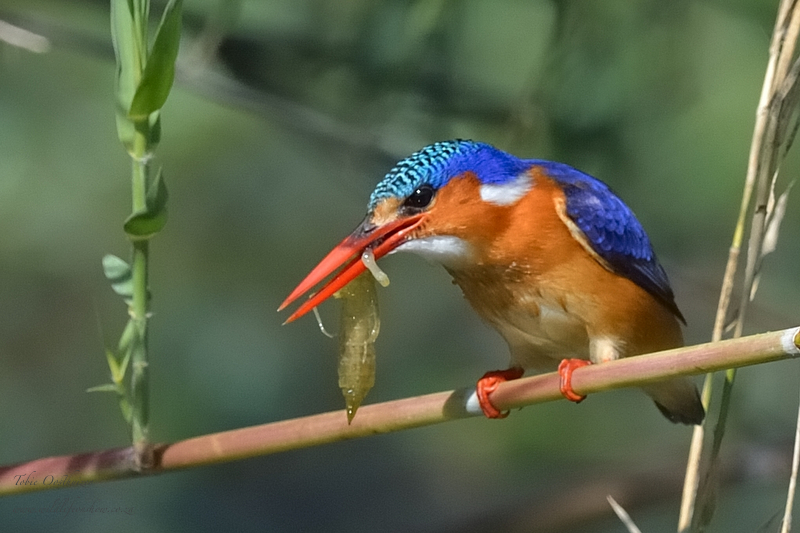 After swallow the meal the cleaning and grooming starts, firstly by rubbing the beak against the branch, then actually diving a few times into the water. 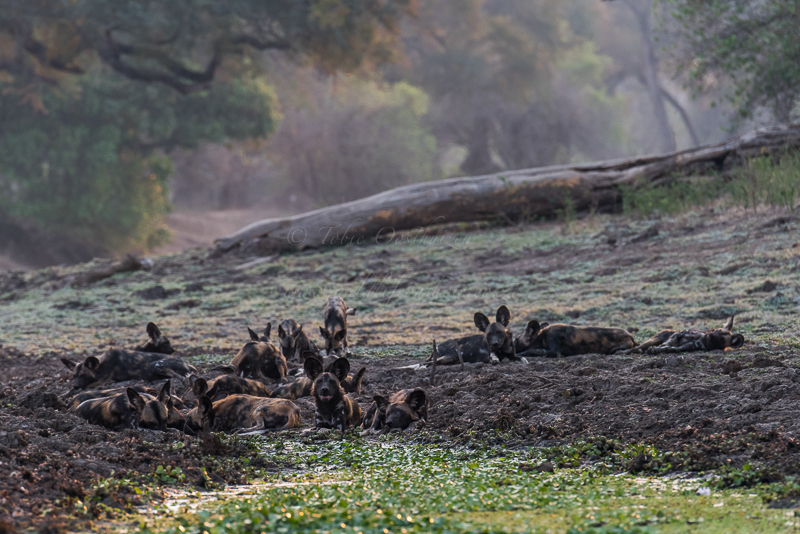 While all this action is going on the other inhabitants of lake Panic go about doing what they do best, eat, relax and enjoy the sun. 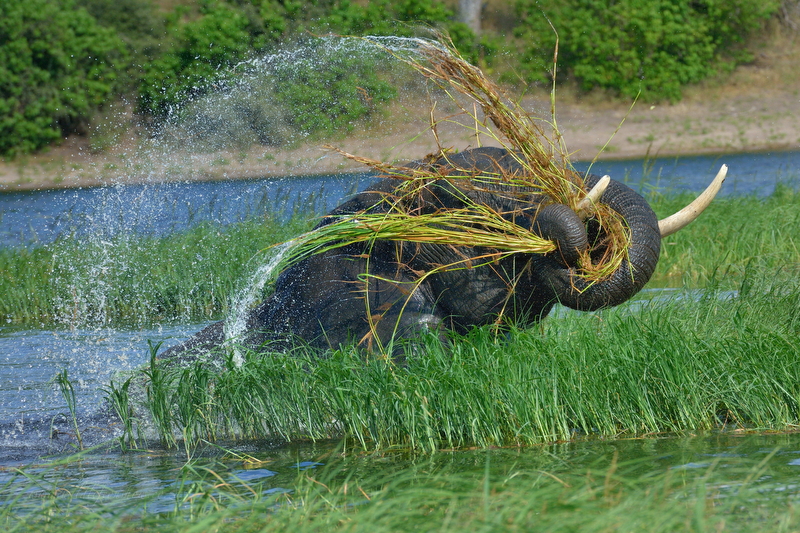 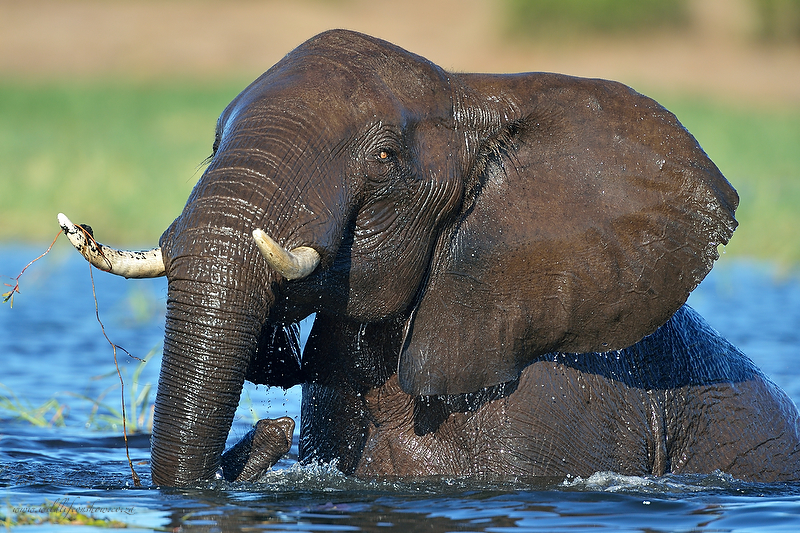 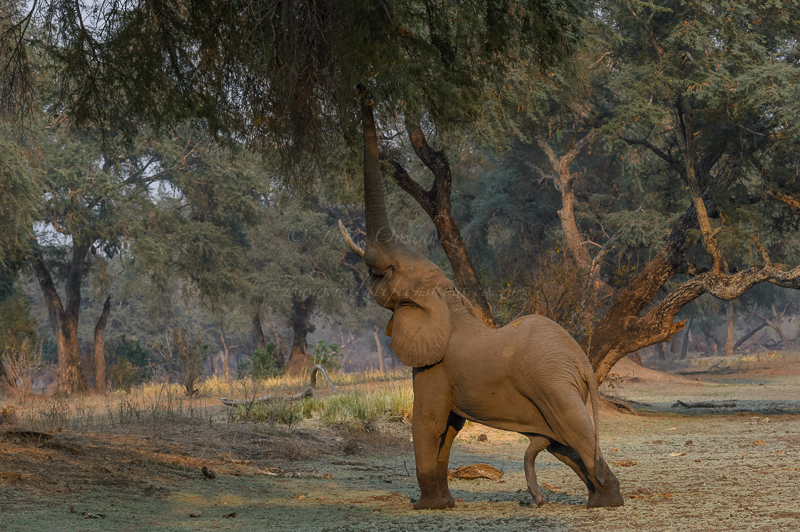 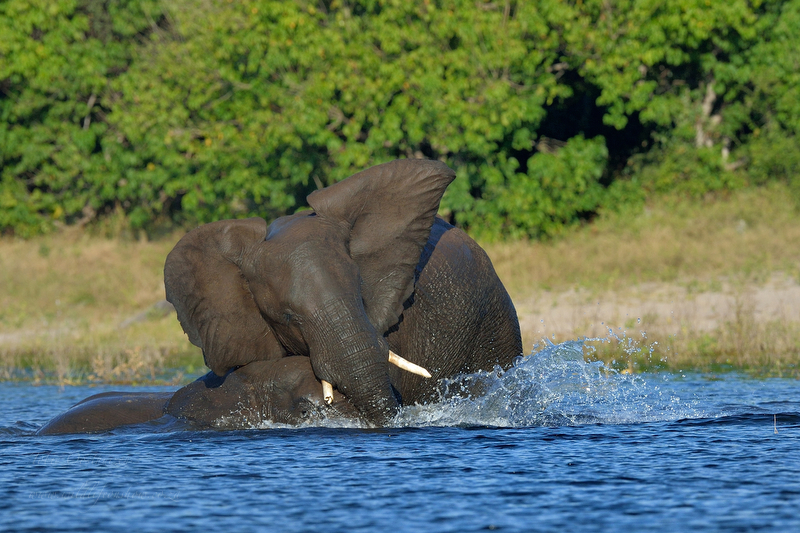 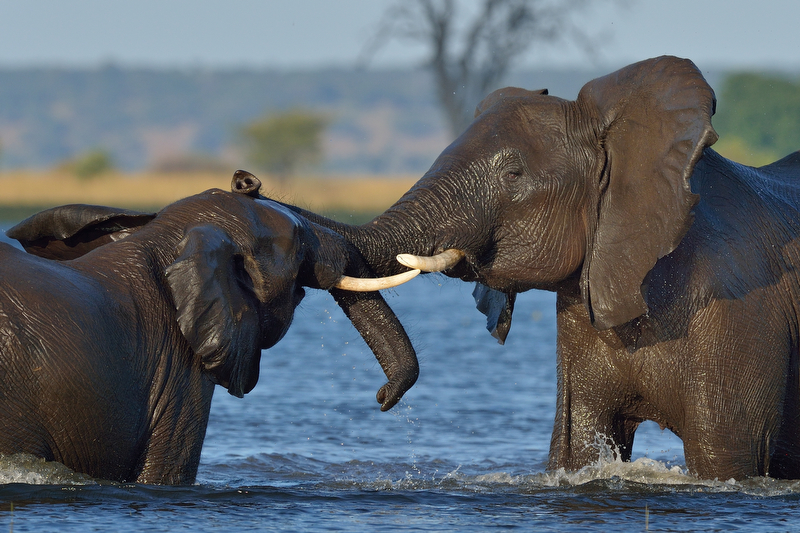 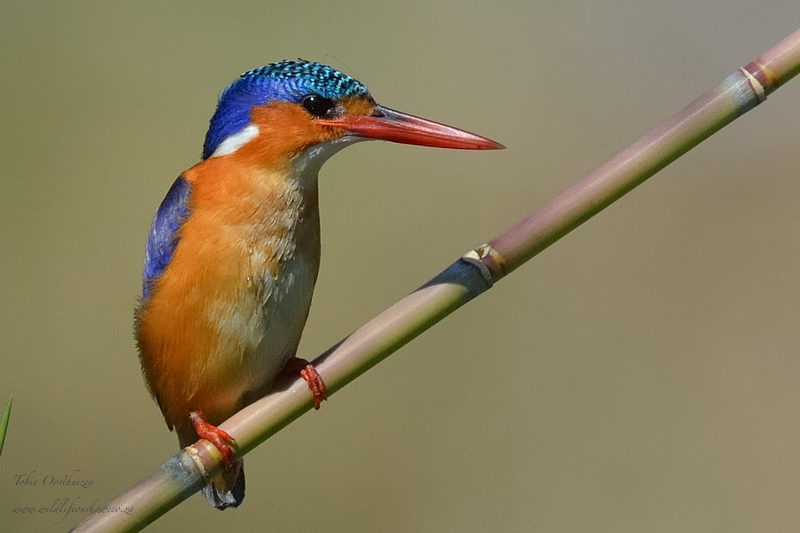 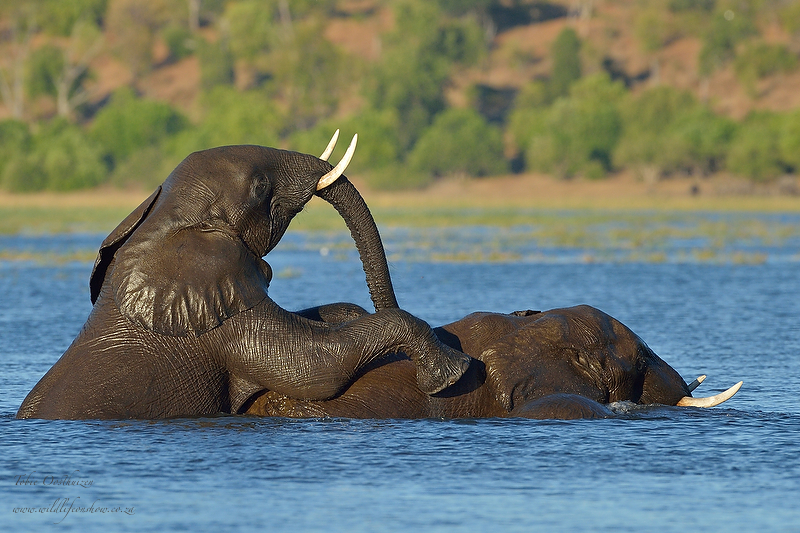 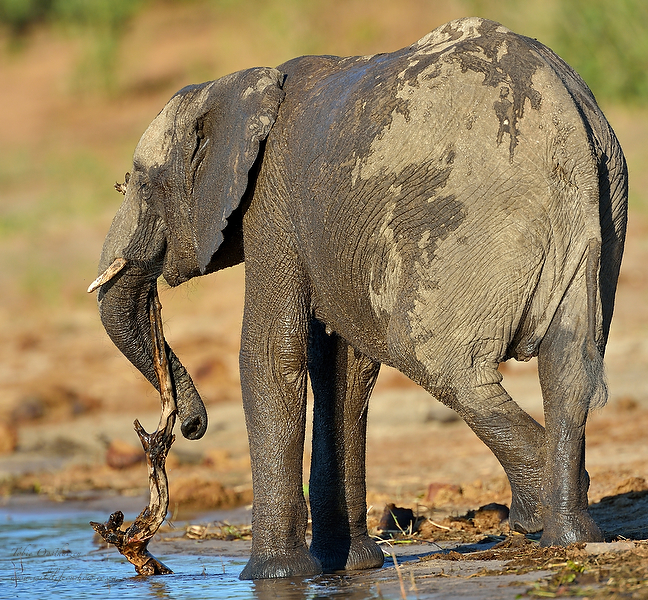 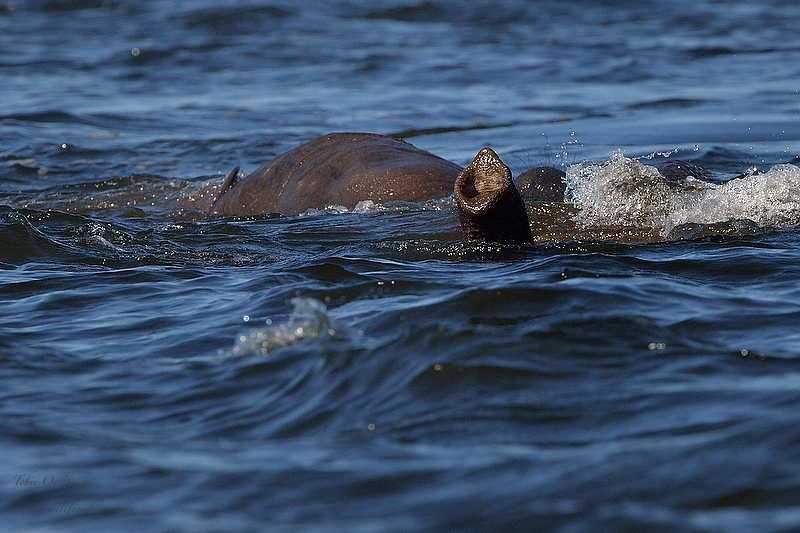 The Chobe River attracts a variety of wildlife but is especially known for it’s abundance of birdlife and huge numbers of elephant. 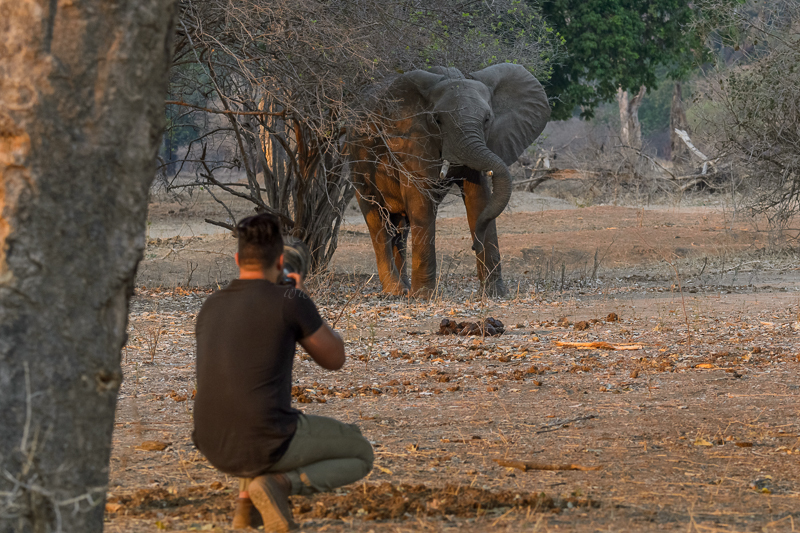 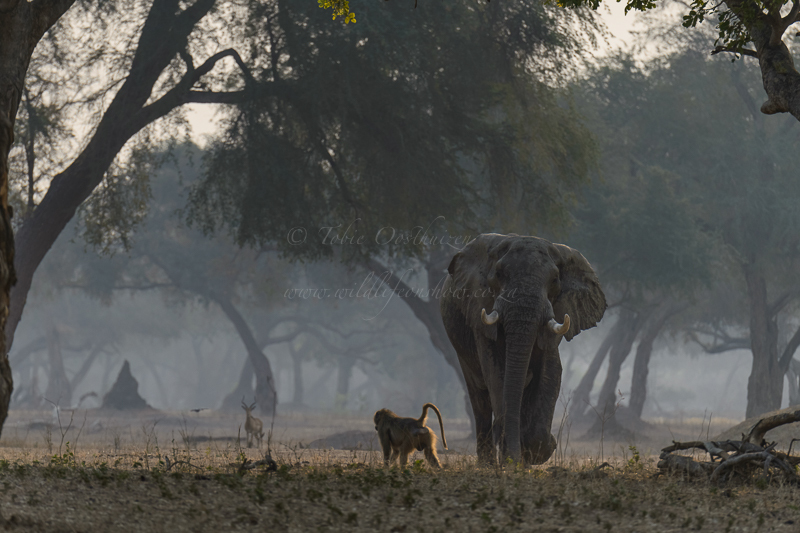 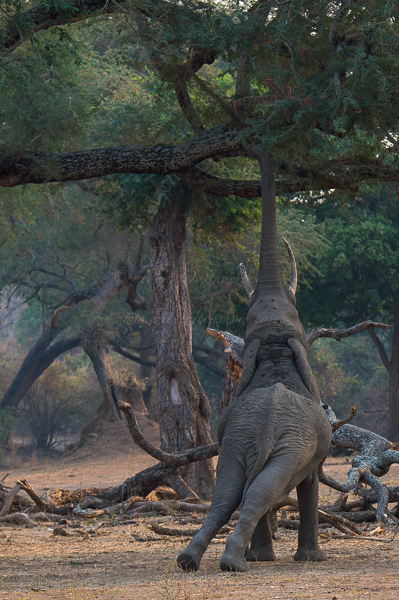 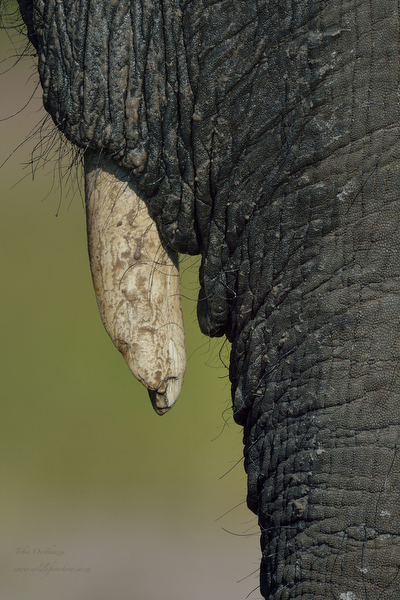 The elephants also are so used to human activity which allows you to get very close to them. 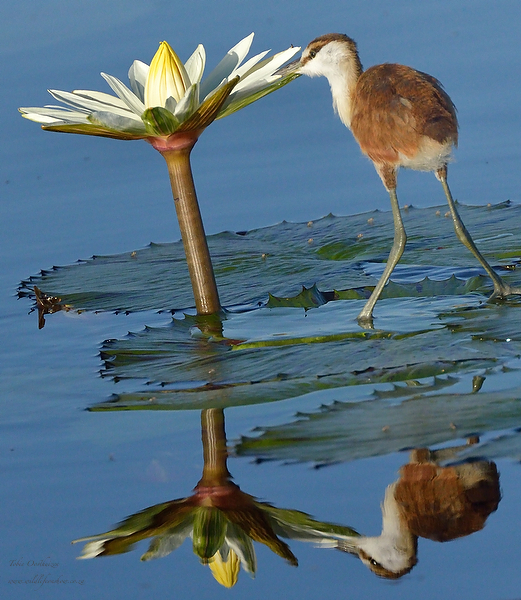 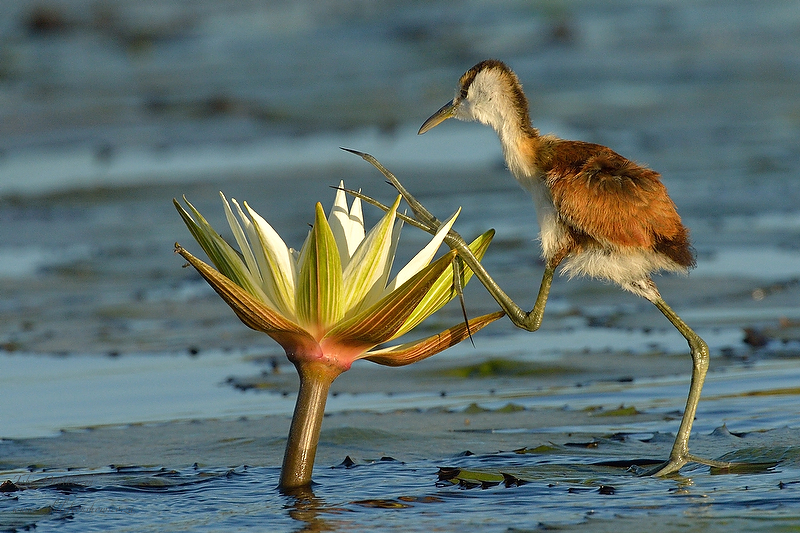 African Jacana chick climbing over water lily, look at those feet !!! 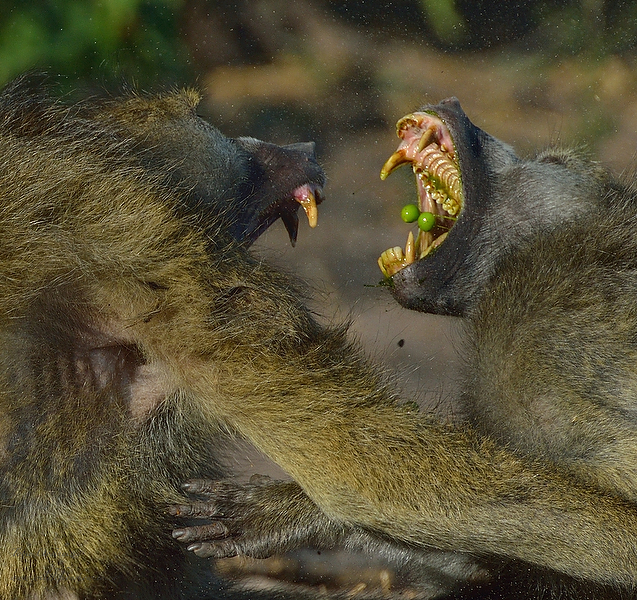 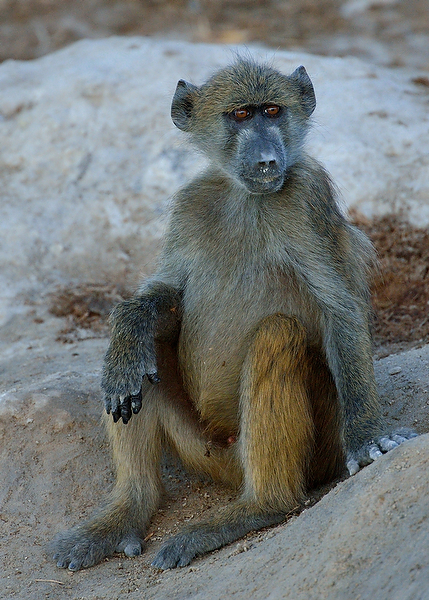 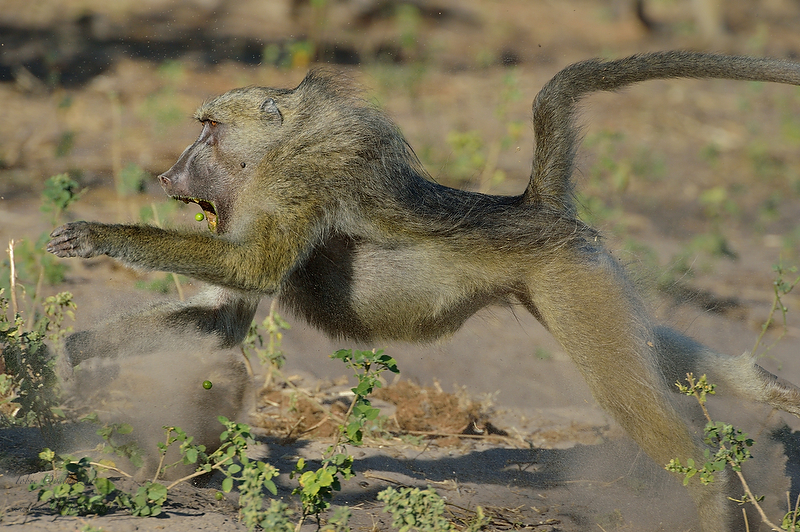 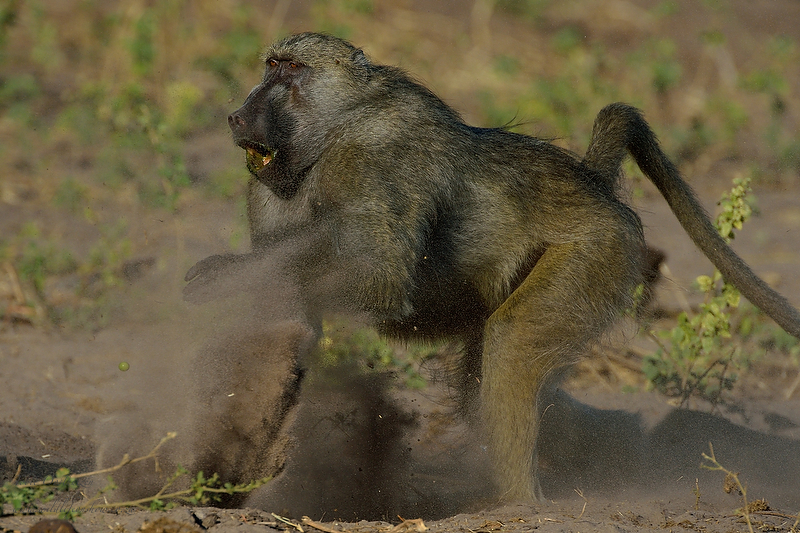 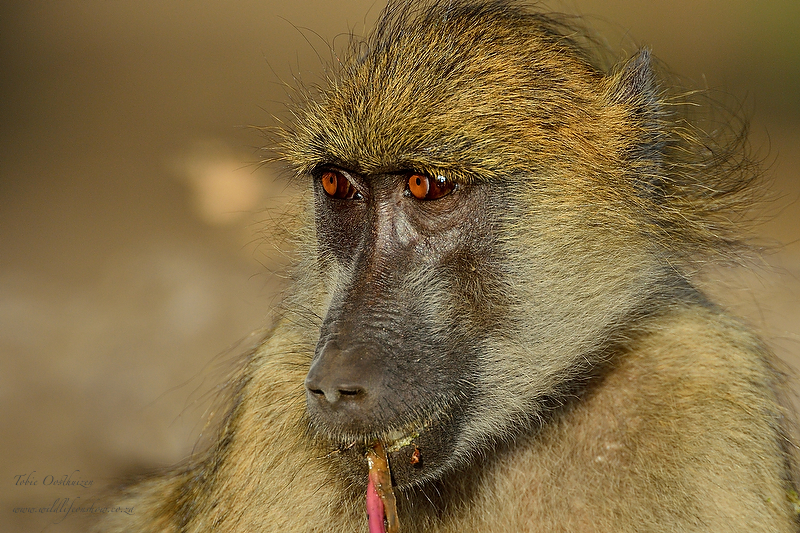 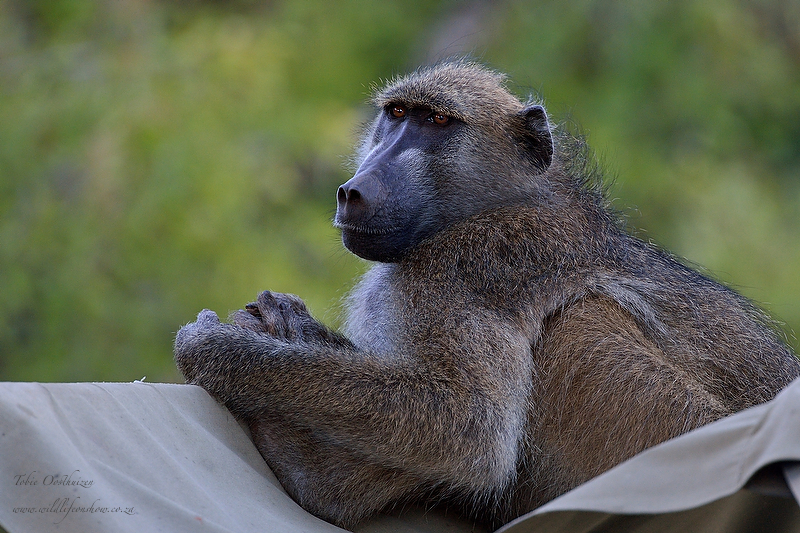 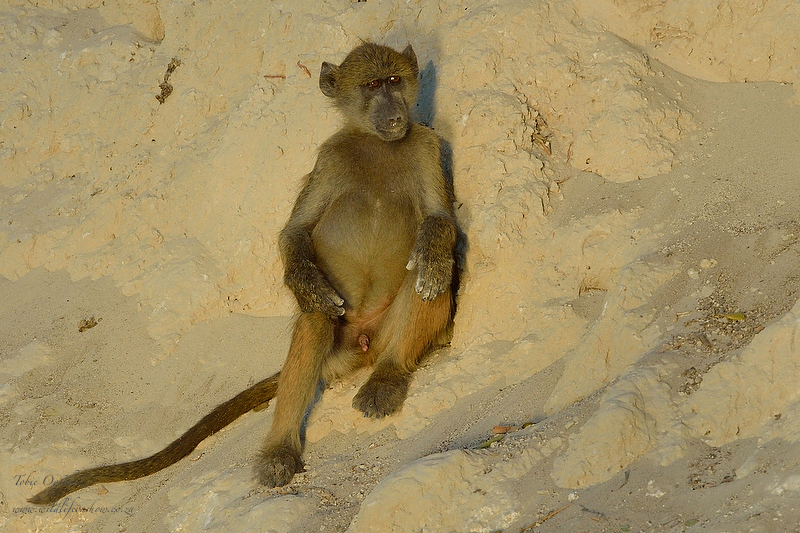 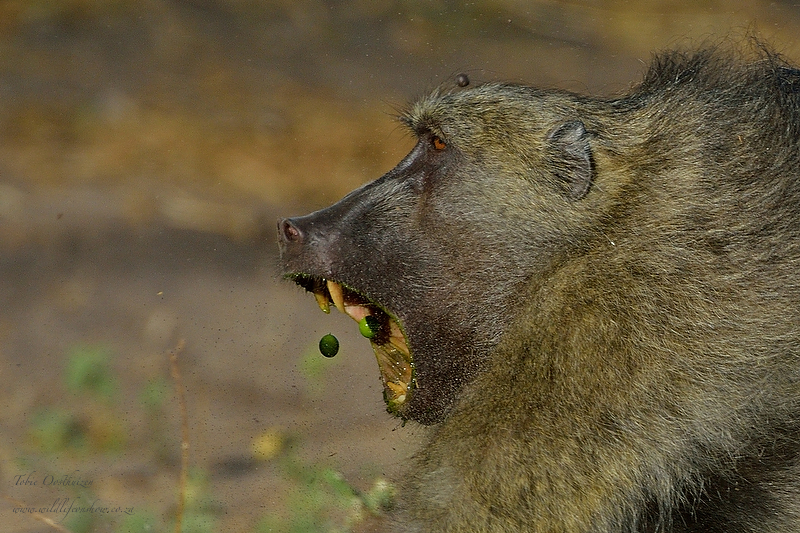 I will post further blogs with some baboon and other action on the river.